Artichokes are one of my favourite vegetables and I consider them a great delicacy. They are in season from the spring to autumn. Artichokes are rich in fibre and minerals (iron, calcium, phosphorus, and potassium). The artichoke is actually an edible type of thistle flower related to cardoons which can be green (as are those from Liguria, Campania, and Sicilia), or violet-tinged (as are those from Veneto, Toscana, and Sardegna). They can have spines or not. Different varieties have different flavours and the spring artichokes are cooked differently than the more mature artichokes. 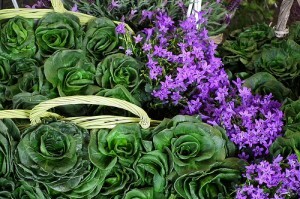 The most common varieties in Italy are: Spinoso sardo, Violetto di Toscana, Precoce di Chioggia, Spinoso di Palermo, Castraure della laguna veneta, Romanesco, Violeto di Ponza, Canarino giallo, Precoce di Jesi, Mazzaferrata, Ascolano, Empolese, Spinoso di Liguria, Violetto di Catania, Violetto di Provenza, Castellammare, and Campagnano. 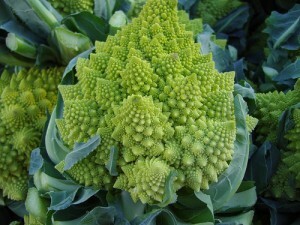 The two varieties awarded the PGI status are the carciofo di Paestum and the carciofo romanesco del Lazio. Buy: You can buy them fresh, frozen, and tinned or jarred in oil, water, or brine. Tinned varieties simply do not compare in flavour to the fresh or marinated kind (sott’olio). When buying fresh artichokes, buy the freshest you can find- they should be firm, tightly closed (although late in the season they may be more open), vibrant in colour, and the bracts (similar to leaves) and stem should be unwrinkled and free from brown spots and holes. The outside leaves may have some scratches or blisters from frost and this does not indicate there is anything wrong with the artichoke. The stem end will tell you how recently it was cut. If you squeeze the artichoke it should squeak. 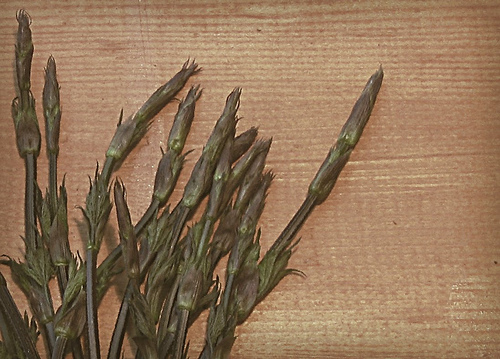 Stems can be up to 20cm long. They should be heavy for their size to ensure the choke is not too large. Earlier in the season, in the winter, the artichokes are small, about the size of an unshelled walnut, whereas later in the season, the spring through the summer, the artichokes can become very large, about the size of your hand. Store: If they have long stems, they are best preserved in a vase of water in the refrigerator. Otherwise they can be stored dry in a plastic bag or sealed container in the refrigerator for 5 to 6 days. Prepare: If the artichokes are to be eaten raw, then the internal bracts (leaves) must be completely soft and uniformly light coloured. Artichokes should be prepared just before eating or cooking as they discolour easily and cut parts should be rubbed with lemon and immersed in acidulated water to prevent discolouration. Preparing an artichoke to eat is one of the most complicated preparations for any vegetable but is time well-spent as their flavour is unparalleled. The preparation also stains your hands (which can be removed with lemon). 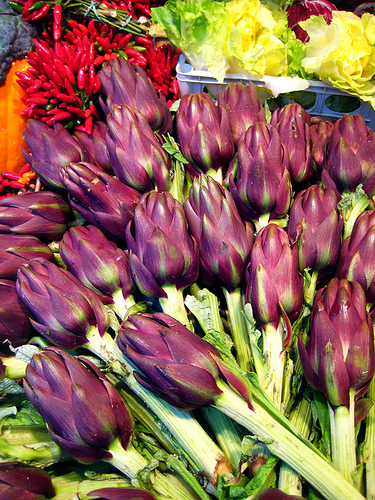 Do not use iron or aluminium (including foil) when preparing artichokes as it discolours them. First prepare a bowl of cold water and squeeze half a lemon into it. Then wash the artichoke, dry and cut the stalk off. Peel the stalk with a small knife or vegetable peeler and slice into 1/2cm rounds and place into the water. 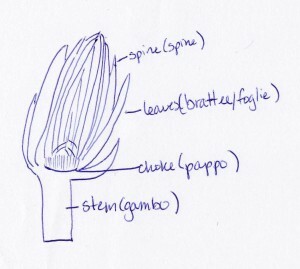 Take the flower and beginning at the bottom slide your thumb down the inside of a bract (leaf) until it is where the bract connects to the flower and snap off and discard. Repeat this until all the tough outer bracts are removed (the inside is a light greenish yellow). 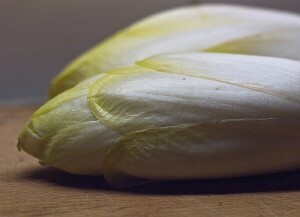 Do not try to retain any of the harder bracts as it will make the entire dish unpalatable in texture. (If you don’t want to waste them, add the removed leaves to the dish on the bottom, and after they are cooked you can pop the end in your mouth and scrape the pulp off with your bottom front teeth.) Cut the top of the remaining flower off and trim the base with a small knife. In the centre of the flower is a hairy choke (that literally sticks in your throat and chokes you). Use a small spoon or a melon baller to remove this hair. Your artichokes are now ready to use. Eat: They can be eaten raw (only for baby artichokes), boiled (cacocciuliddi spinusi), roasted, steamed, sautéed (carciofi al funghetto), baked, braised (carciofi alla romana), stuffed, fried, deep-fried (carciofi alla giudia), or preserved in oil or vinegar. 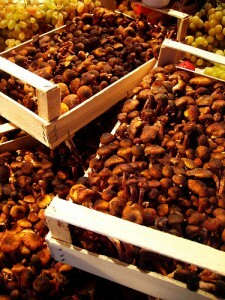 They are used in liqueur (Cynar), starters, in pastas, soups, savoury pies (torta pasqualina), risotto, and side dishes. 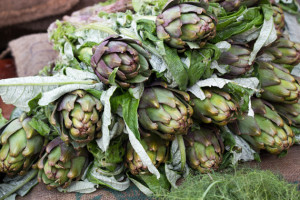 Artichokes pair well with marjoram, garlic, rosemary, thyme, bay leave, lemon, orange, capers, fennel, Parmigiano-Reggiano cheese, goat cheese, olive oil, butter, peas, beans, asparagus, potatoes, and mushrooms. Asparagus is a vegetable with a long, thin, white, violet or green stalks culminating in a tip. Asparagus can be eaten while young whilst the stalks are still thin and tender, or later in the season when the stalks are more fibrous and thick (preferably no more than 8 mm in diameter). They are in season from March until June. Asparagus has folic acid, vitamin C, potassium, and beta-carotene. The white asparagus are green or violet asparagus which have been deprived of sunlight in order to preserve their white colour. The white varities in Italy include: Bianco di Bassano PDO, Bianco d’Olada, Bianco di Germania, di Pescia, di Cesana, bianco di Cimaldomo PGI, and Grosso di Erfurt. The violet varieties include: Precoce di Argenteuil, Tardivo di Argenteuil, violetto di Albenga, and Napoletano. A green variety with PGI satus is verde di Altedo. Asparagus from Ravenna are considered to be some of the best. Buy: They should be sold in a cooled environment. 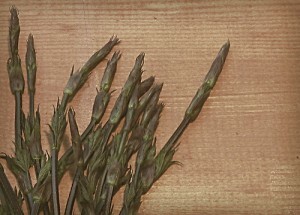 The cultivated varieties of asparagus range from thin when young (about 4 mm in diameter) to thick when later in the season (2 cm or more in diameter). These have green stalks, may have a green or violet tip, and are intense in flavour. The white varieties are milder in flavour and more delicate. They are considered a great delicacy in Europe. There are also wild asparagus (selvatico) and forest asparagus (di bosco / bruscandoli). Look for tightly closed tips which are dry, firm (but not hard), free from discolouration, and have not begun to bud. Stalks should be dark green, unwithered, uniformly firm with no wrinkles and not limp. There should be no signs or rotting. The stalks should be heavy for their size. Tips which are not tightly closed and are separating are not fresh. 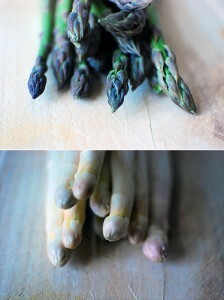 Look at the cut end to see how fresh the asparagus is- moist, firm, unoxidised ends are the best. Select stalks of uniform thickness to ensure even cooking time. Thinner asparagus are often, but not always, more tender. Thicker, more fibrous asparagus may need to have its outer skin peeled. An ideal thickness is about 1cm. Store: Asparagus should be eaten as quickly after harvesting as the sugar in the plant converts into starch which destroys the flavour and texture as it becomes woody. Do not wash asparagus before storing. Remove any binding from the asparagus as this encourages rotting. Asparagus can be stored with the cut ends of the stalk standing in 2cm of water in a jar, or the cut ends wrapped in wet paper towel, covered with a plastic bag in the refrigerator for up to two days. Prepare: Rinse the asparagus, paying particular attention to the tips, gently rubbing the asparagus with your fingertips under cold water to remove any sand. Start bending the stalk from the bottom to feel its natural snapping point where the stalk snaps cleanly, preferably 1 to 2cm from the bottom. Discard the woody ends. If the stalks are 5 mm in diameter or more, then cut the woody bottoms off as they will not snap uniformly. Then use a vegetable peeler to delicately remove only the waxy outer skin on the bottom 2/3 of the stem. The challenge when cooking asparagus is that often the tips cook faster than the stalks, and may break when being transferred. The solution (if a pot is not used which can hold the asparagus standing on end) is to tie the stalks together when cooking. Be careful not to cook the asparagus in rapidly boiling water or they can be easily damaged. Eat: Asparagus can be eaten hot or cold and are served raw, fried, deep-fried, boiled, grilled, roasted, sautéed, steamed, or braised. Asparagus should be cooked quickly until tender but still crisp. Poke one with a knife to ensure it can be inserted easily but still has a little resistance. Be careful not to overcook as they will turn dark green and go limp. For many recipes, the asparagus is already cooked before adding to the recipe. These can be eaten lightly cooked and dressed with a sauce (asparagi alla bolzanina) or just olive oil, lemon, salt, and pepper or used in risottos, pasta sauce, moulds, pies, omelettes, soups, and fried. Asparagus pairs well with olive oil, butter, Parmigiano-Reggiano cheese, fontina cheese, eggs, parsley, basil, sage, mint, lemon, orange, capers, peas, artichokes, leeks, and broad beans. 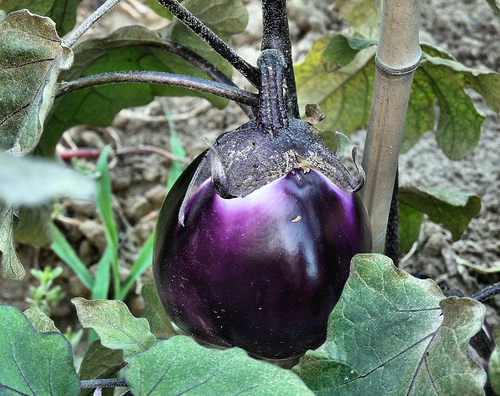 Aubergines in Italy are purple, white, pink, green and yellow, orange, mottled purple and pink, or mottled purple and white. They are vegetables and can be round, egg-shaped, oblong, or long. Aubergines have a slightly bitter flavour. The Italian name for aubergine, “melanzana“, derives from “mela insana” meaning noxious apple. 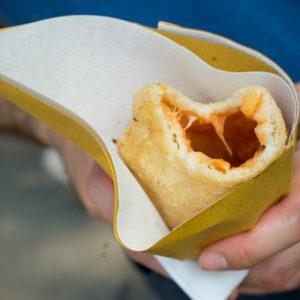 They are eaten all over Italy but are particularly popular in the south. They are in season from June to October. Aubergines are a good source of iron. The round varieties include Violetta di Firenze, Mostruosa di New York and are best for grilling as they are less likely to dry out. The egg-shaped varieties include Bianca ovale, Melanzana rossa, and Madras. 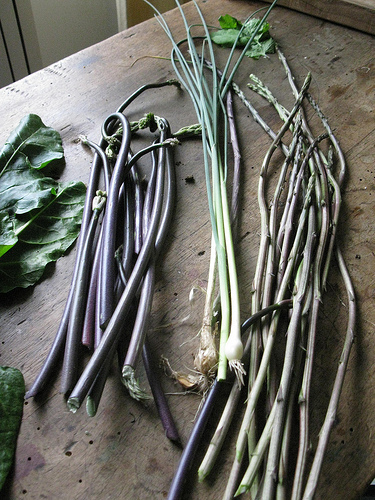 The oblong varieties include: Black beauty (Bellezza nera), and Larga Morada and are good for frying. 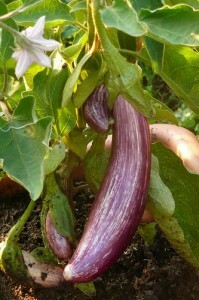 Long varieties can be up to 20cm long and include Violetta lunga di Napoli and Slim Jim and are good for frying. Buy: Aubergine can be bought fresh, dried, or preserved in oil. To buy fresh, the elongated varieties tend to have a stronger flavour and be better for frying while the round and oblong varieties are more delicate in flavour and are better for layering. Generally, the lighter the colour of aubergine, the lighter the flavour. Look for aubergines which are smooth, firm, unblemished, and have a deep, evenly glossy colour. Ones with a smaller navel on the bottom indicate that the aubergine is male and will therefore have fewer seeds. 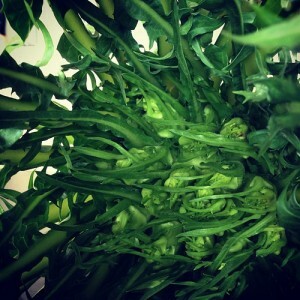 Bright green stems indicate freshness. Aubergines which are heavy for their size but small for their variety are tastier. Store: Aubergine can be stored in wrapped in paper inside a plastic bag in the refrigerator, covered for up to a week. Aubergines become increasingly bitter with time so consume them as soon as possible. If this is not possible, salting as part of the preparation will help remove any bitter flavours. Prepare: Some recipes call for the aubergine to be sliced and salted in a colander to draw out the moisture. This is done to draw out any bitterness, reduce the amount of water to facilitate frying, and change the texture of the aubergine. Look at the aubergine and if it has fairly large seeds then it will need salting. Typically the smaller and elongated varieties are soaked in salt water to remove bitter juices (and generally also because they are used for frying and salting the aubergine means it will absorb less oil). If you do not salt the aubergine, then rub the sliced aubergine with lemon juice to prevent it from discolouring. Typically the skin of the aubergine is retained when cooking, so to prepare just rub the aubergine skin under cold water and cut off the stem. If you are frying the aubergine, use very hot oil and fry the aubergine quickly so that it does not absorb much oil. Drain the aubergine on a wire rack or paper towel to drain excess oil. Eat: Aubergines are often fried, deep-fried, grilled, roasted, stuffed, sautéed, braised, or stewed (caponata). 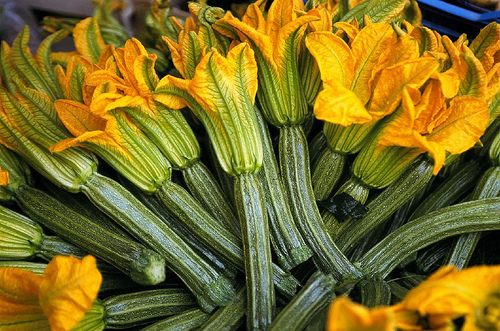 They are used in salads, fritters, pastas (alla Norma), and baked with various toppings (melanzane alla parmigiana). Aubergines pair well with olive oil, Parmigiano-Reggiano cheese, ricotta cheese, mozzarella cheese, goat cheese, garlic, basil, saffron, vinegar, lemon, pine nuts, tomatoes, peppers, onions, zucchini, chickpeas, and potatoes. Beans are legumes and are well-loved in Italy, particularly in Toscana (where the people are called “mangiafagioli”, meaning “bean eaters”) and in Veneto. Every region in Italy has a local bean dish. Beans have been popular since Roman times. Beans are extremely nutritious and an excellent protein substitute for meat, if mixed with other cereals. They can be eaten fresh or dried. Beans grow in a long pod which is opened and the beans inside removed. There are many varieties of beans eaten in Italy. The main varieties are borlotti (medium length and are white and red mottled), cannellini (small and white), Scottish beans (white mottled with violet), and Spanish beans (big and are either violet “kidney beans” or white coloured). PGI varieties include fagiolo di Lamon, fagiolo di Sorana, and fagiolo di Sarconi. Fresh beans are in season from June until September and are generally 8 to 15cm long. They are a good source of protein, calcium, phosphorus, iron, potassium, and vitamins A and C. Beans are generally not considered a refined food, despite being quite nutritious, probably due to their property of creating flatulence in those who eat them. Buy: Beans are typically bought dried, tinned / jarred, or fresh. Beans are best fresh. If fresh beans are not available, cooking dried beans are also very good. If the process is too cumbersome or time consuming then tinned are fine. Fresh beans should be mature, crisp, firm, full-coloured (no discolouring), lumpy so you can see the beans inside have matured and are not dried out (although the pod should feel tough and leathery), and be unblemished (free from black or brown spots and holes). Shelled beans will be about half their weight with the shell so adjust this according to your recipe. Dried beans should be purchased as close to their harvest date as possible as they harden over time. Try to use within 6 months of purchase but definitely within 1 year. The beans should be bright and shiny. Dried beans should not be wrinkled as this is an indication that they are old. Inspect the packaging for any signs of insects, dust or mould. Tinned beans have a softer texture than fresh or dried beans and will disintegrate if cooked for too long. For tinned beans, add them to the recipe during the last 10 minutes of cooking to ensure they remain whole and reduce the salt in the recipe if the beans contain salt. Store: To store fresh beans, place them in the refrigerator and ensure that they are dry and have good air circulation so that they don’t mould. Do not shell them until you are about to cook them. They are best consumed as soon as possible but may be stored in the refrigerator like this for 3-5 days. If you can’t use them within this time period, shell and freeze. To shell fresh beans, snap off the stem end and pull downwards along the spine to remove the string. Use your thumbs to pull the pod open and then slide your thumb along the inside to remove the beans. Dried beans should be stored in a cool, dark, dry place and should not be kept for more than a year or they will stay hard when cooked. They should be kept in an airtight container. Tinned beans can be kept in the cupboard until their expiration date indicated on the package. Tinned beans can be used directly from the tin without soaking or parcooking. Prepare: To shell fresh beans, hold the stem end and break open using your thumbs to open the shell and dislodge the beans into a bowl. Discard the shells. To prepare dry beans, rinse them and discard any stones, as well as any mouldy, damp, wrinkled, broken, or discoloured beans, then soak them overnight- or even for 2-3 days. Make sure the beans are covered by about 8 cm of fresh, tepid water. If the weather is hot, refrigerate the beans while they soak. The older the beans are, the longer you will need to soak them. (If you don’t have time to soak the beans overnight, you can wash them, then put them in cold water, bring to a boil for 5 minutes, remove from heat, let sit for 1 hour, strain, discard the water, and then the beans are ready to use.) Pick through the beans to ensure there is no debris, discard the water. To cook fresh or dried beans: add new, fresh water and any aromatics. Some people say that adding salt when cooking beans makes them hard but I have never had this issue with beans that are not old. Simmer the beans in the water until tender as per the recipe. The older the beans are, the longer they need to be cooked. Cooked beans can be kept in a sealed container in the refrigerator for up to 4 days. Eat: Beans are used in starters, pastas (pasta e fagioli), soups (minestra di fagioli), salads, and as accompaniments to meat (fagioli all’uccelletto). 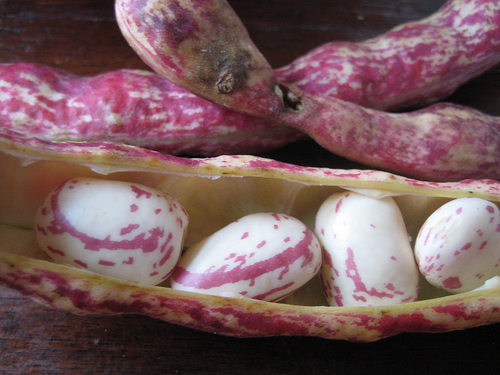 A borlotti bean is an oval-shaped bean which is cream coloured with dark red streaks with a nutty flavour. 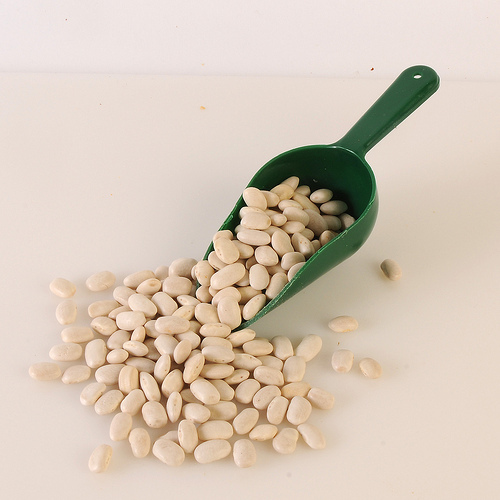 Buy: Lamon PGI beans are a high quality borlotti bean from the town of Lamon in Veneto. Use the same criteria as in the general bean section above. Store: Fresh borlotti beans should be kept in a bag in the refrigerator for 2 to 3 days. Prepare: Fresh borlotti beans can be prepared by snapping off the stem and using your thumbs to open the pod and slide out the beans. Use dried beans as per the recipe but they are generally cooked slowly for 1 to 1.5 hours. Eat: Borlotti beans are often boiled or sautéed. They are used in stews, mixed with rice, mixed with pasta (pisarei e faso) as an accompaniment to meat, and in soup (pasta e fagioli alla veneta, fagioli con le cotiche, minestra di fagioli alla emiliana, and minestra di fagioli alla friulana). Fava beans are one of my favourite vegetables and are well-worth the time and effort to prepare. Fava beans are meaty and strongly flavoured with herbal notes. These beans are one of the oldest foods of the Mediterranean. Fava beans are a spring vegetable that come in long pods ranging from 10 – 30cm long. They are light green in colour. When opened, they have a thick, soft lining nestling the beans inside. These fresh beans are available from March to May. Fava beans are a good source of protein, potassium, phosphorus, calcium, fibre, and vitamins (A and C). The main varieites are Auperaguadulce, Aguadulce Supersimoia, Reina mora, and Baggiana. Buy: You should select pods which are with no brown spots, look plump, crisp, are green (not yellow) and which are about 15cm in length. You should not be able to easily define the shape of the bean inside or the bean is past its prime. Avoid beans with blackened ends and if you can, split one open and look inside. The soft inner lining should be moist and the beans firm. If you twist off an end, the pod should be crunchy and juicy. Eat one if you can to taste if it is sweet and tender. The young beans should be tender and sweet although slightly bitter. Beans which are too old will have lost their bright green colour and will be starchy. They are also available dried, canned, or frozen. Only the frozen ones are substitutable for fresh ones. 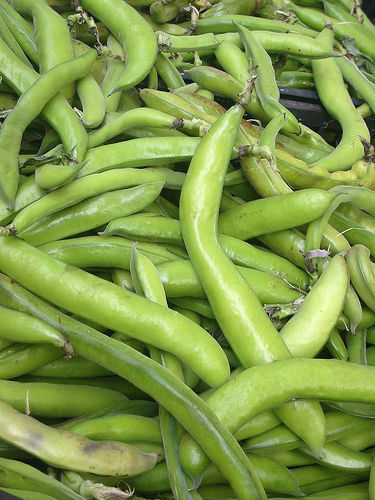 Store: Fresh fava beans may be wrapped in plastic and kept in the refrigerator for 2 or 3 days. Frozen fava beans should be stored in the freezer, tightly sealed for up to 10 months. Dried fava beans may be kept in a cool, dry place sealed for up to a year. Prepare: Podding fava beans can be a chore so get the family to help out and make it fun. I get my 2 year old son to help me with podding as he loves to help out. To prepare fava beans, remove the pod, parboil for 2 minuted if fresh and 4 minutes if frozen and then cool in ice water to stop the cooking and bring out the colour. When cool, use your fingernail to pierce the waxy skin around each bean and squeeze the opposite end to pop the bean out. Cook as required in the recipe but typically about 8 to 10 minutes. Prepare dried fava beans as described in the main bean section above. Eat: Only the fresh, young, tender, springtime fava beans can be eaten raw (with salami or pecorino cheese). They are used in starters, pastas, soups (favata alla sarda, zuppa di fave alla calabrese, and minestra di fave alla pugliese), salads (fave in insalata di Campania), with meat (fave a coniglio alla siciliana), and side dishes (fave col guanciale alla romana). The dried beans can be cooked and pureed (macco and ‘ncapriata). Cannellini beans grow inside a green pod about 8cm long. 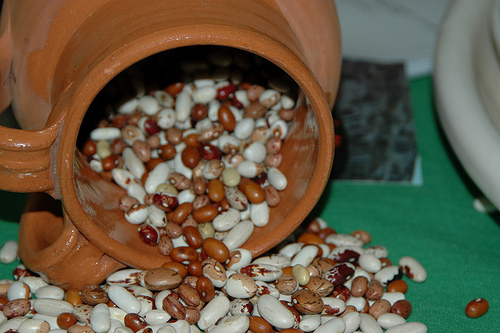 The beans are white, small, flat with rounded ends. They are eaten regularly in Toscana. Buy: Cannellini beans come dried or tinned. Store: Fresh cannellini beans need to be kept in a bag in the refrigerator for 2 to 3 days. Prepare: For dried beans, prepare according to the general bean section above but they are generally cooked for 1 to 1.5 hours. Eat: Eaten cold in salads (insalata di fagioli), as a side dish to meat (fagioli all’uccelletto or fagioli al fiasco), and in soups (ribollita). Chickpeas grow on a plant inside a husk with a nutty flavour. They are rounded, cream in colour, and are smooth and resemble a hazelnut in shape. They are harvested between June and October but are not eaten fresh. 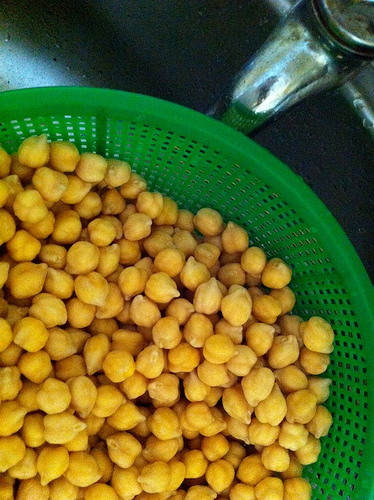 Buy: Chickpeas are typically sold dry, tinned, or ground into flour. The tinned variety can be interchangeably used with the rehydrated dried chickpeas. Prepare: For dried beans, prepare according to the general bean section above. They take much longer than other legumes to soften and may need to be cooked for 1 to 3 hours. Eat: Chickpeas are eaten in salad, lightly dressed on their own, in soup (cacciucco di ceci alla pisana and minestra di ceci toscana), in pasta (tria, ceci e pasta alla pugliese, lagane e ceci alla basilicata, panelle alla sicilia, and pasta e ceci alla romana), and in stews (ceci con la tempia di maiale and cisra). The flour is used in Liguria to make farinata and panissa. Lentils have been eaten for over 9,000 years. Lentils are the flat rounded seeds of a plant and come in pods with 2 to 3 lentils inside. They range in colour from yellow to orange to brown to green. 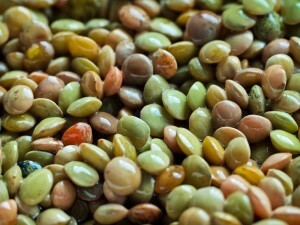 Lentils are rich in nutrients, protein, phosphorous, iron, and vitamin B. The main varieties in Italy include Egizina, di Villalba, del Fucino, di Castelluccio, di Altamura, and di Mormanno. 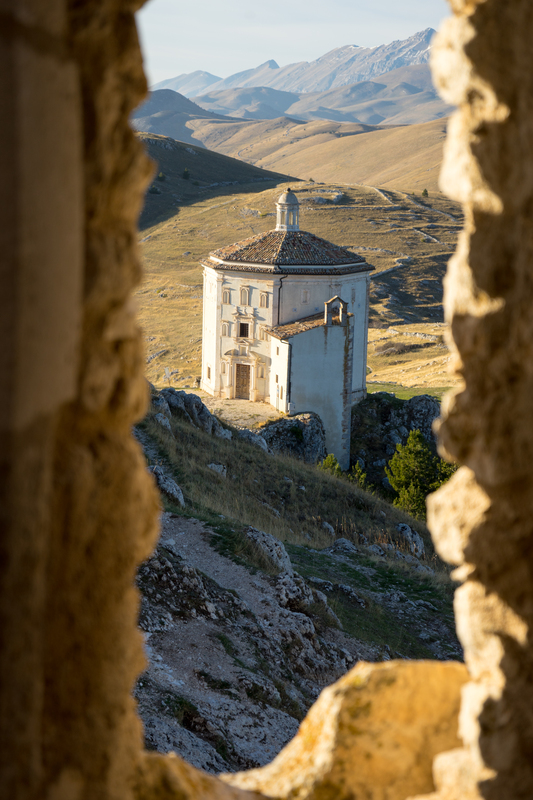 The most prized variety is Lenticchia di Castelluccio di Norcia PGI from Umbria. Buy: Lentils are sold dried. The quality of the lentil is determined by the variety and the soil in which it was grown. Prepare: Lentils do not need to be soaked in advance, but they can be. They are boiled or braised in liquid but should not be cooked in untreated aluminium. They take between 25 to 60 minutes to cook depending on their age and variety. Eat: Lentils are eaten on New Year’s Day in parts of Italy for good luck. They can be eaten hot or cold in soups, salads, pasta (pasta e lenticchie alla Campania), and as an accompaniment to sausage (lenticchie con il cotechino). Beets are a winter root vegetable with a pleasantly sweet and earthy flavour. Beets are very beautiful and come in hues of purple-red, red, yellow, and orange. The root can be round or elongated. The leaves are eaten more frequently in Italian cooking and salads. 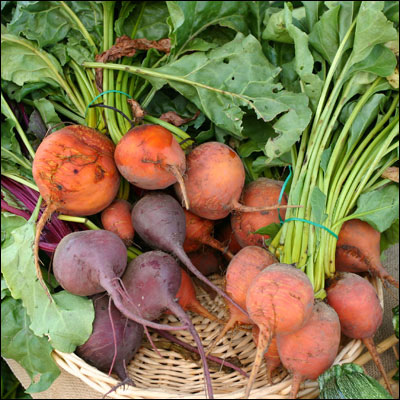 Beets are in season from July to November and can be kept through the winter. 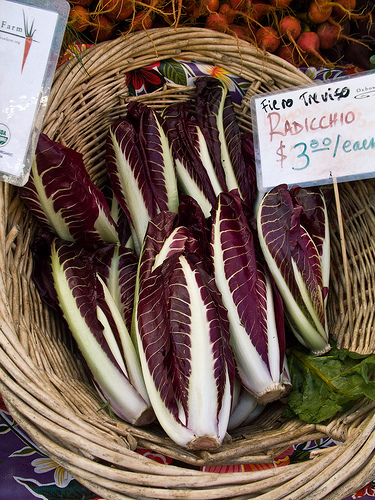 The best varieties in Italy are Nera piatta d’Egitto, Chioggia, and Ossa cilindrica. Buy: Choose beets with their greens attached so you can verify their freshness. If this is not possible, try to buy beets with at least 5cm of stalk attached so that their colour stays intact during cooking. Beetroot should be firm, regularly shaped, unwithered, and free from holes and black marks. They should have a long tipped whispy end where the tip of the root is and ideally be around 5cm in diameter or less. The smaller the beet, the more tender it is. Irregularly shaped beets are often due to bolting and will be woody, tough and bitter. 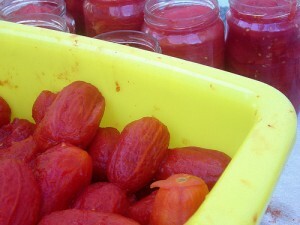 Jarred or tinned beets do not compare to fresh ones, especially when freshly roasted at home. 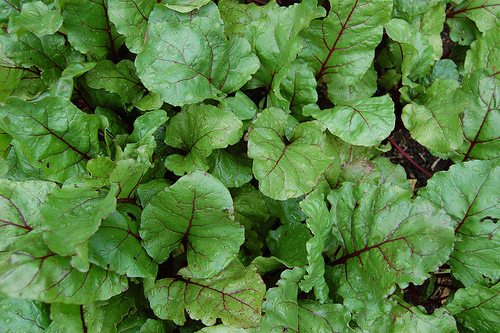 Store: If the greens are attached to the beet, then cut them off about 5cm from the root. 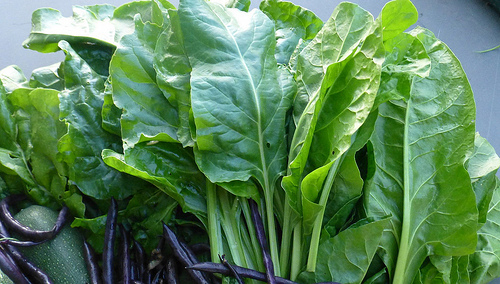 See beet greens below for more details. Beets are best kept in a dry, cool place unpeeled and loosely wrapped, for up to 3 weeks. Cut the greens off and reserve separately, wrapped and refrigerated. Prepare: Beets must be cooked until tender otherwise they can be bitter. They should not be overcooked as they become mushy. They are best when roasted as it concentrates their flavor. Cookeing them with their skins on preserves their colour. They can be peeled afterwards. Eat: Beets can be roasted, baked, boiled, steamed, pickled, and grated raw for salad. 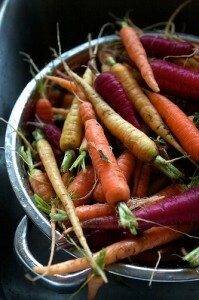 They pair well with onions, apples, olive oil, butter, lemon, orange, mustard, capers, parsley, rosemary, and garlic. This is the top leafy part of the beetroot which is green with streaks of red. The greens are delicious and are not so much sweet as slightly nutty in flavour. I love beet greens in savoury tarts such as torta verde. They are similar to chard, or spinach. They have a thick texture and mild flavour. Buy: Choose greens which are tender looking (small bunches with small, bright green leaves and thin ribs) as older leaves can be chewy. The leaves should be bright green and unblemished and free from holes, yellowing, withering, rot, or brown marks. Although even if the leaves are withered and yellowing, the root is still good to eat. 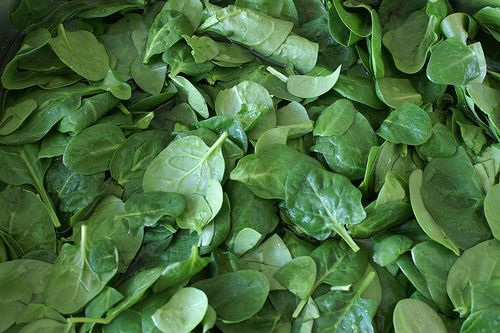 Store: The greens are best used within a day of purchase and can be kept in a plastic bag in the refrigerator. Prepare: Wash thoroughly in several changes of cold water. Discard any yellow or rotting leaves. If the leaves are wider than the length of your fingers, cut the leaves from the ribs and prepare according to the recipe. 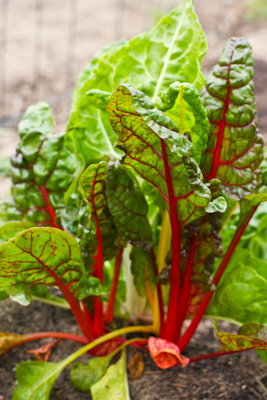 Eat: Beet greens can be used interchangeably with chard or spinach. 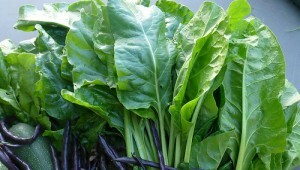 Beet greens are also used in pastas and pies (torta verde) and are well suited to slow braising. Baby beet greens are used in salads. 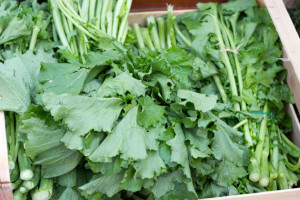 Broccoli raab is a vegetable which is actually the leafy greens of the turnip. The flavour of turnip tops is more bitter than Calabrian broccoli. The stalks and leaves are similar to gai lan which has long stems. 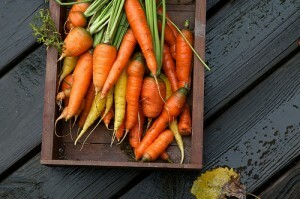 They are in season from spring through summer, although some varieties are in season during the winter. Buy: Turnip tops should be young, tender leaves and unopen flowers of the turnip plant. 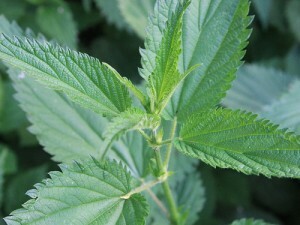 The stalks should be as thin as possible and the leaves tender. Store: Turnip tops can be kept for 1 day in the refrigerator but are best consumed upon purchasing. Prepare: Remove the leaves from the stems and discard any damaged, yellow, or tough leaves. Rinse the leaves in cold water. Peel the inner stalk and use the chop the white part inside. Eat: Turnip tops can be cooked just with their washing water attached but then have a stronger, bitterer flavour. Instead, if they are boiled in salted water, strained, and shocked in cold water, they become sweet. Turnip tops are often boiled in salted water and dressed with olive oil and vinegar or lemon. 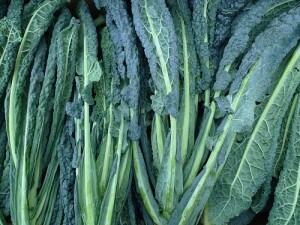 They are typically served as a side dish (such as broccoletti gratinati friarielli ala napoletana, and broccoletti di rapa affogati alla pugliese). Turnip tops pair well with fried or stewed with garlic, olive oil, and chilli, gratineed, cooked with tomato, or cooked with wine and then used to dress pasta or flavour cooked bread. 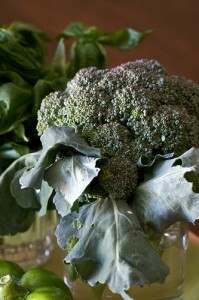 Broccoli is a vegetable which is part of the cabbage family and comes in many forms in Italy. 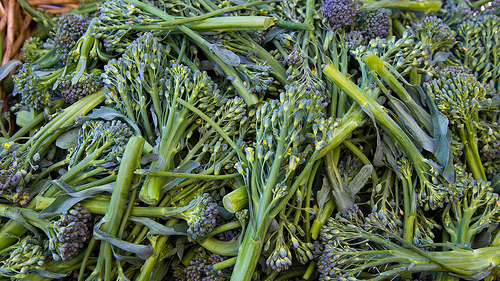 Broccoli in Italy can be green, pink, or purple (in Calabria and Sicilia) or white. It has many different regional names but typically is consumed in the south. 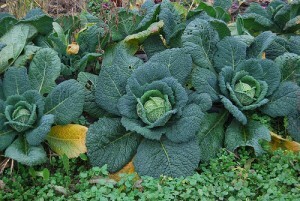 Broccolo in some regions, such as Sicilia, even means cauliflower. Broccoli is full of vitamins A and C, calcium, and phosphorus. 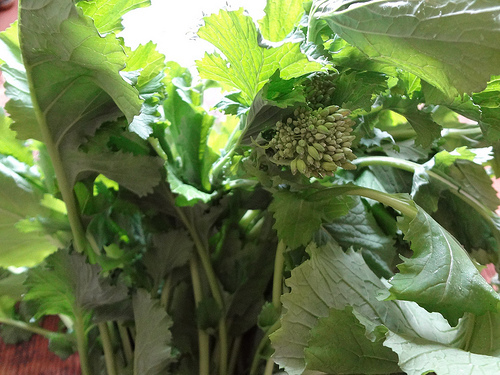 Buy: Broccoli flowers should be dry, firm, closed tightly and not have started to open and show petals. The leaves should be brightly-coloured and fresh looking. Broccoli heads should not have yellow flower buds or any sign of yellowing. The florets should snap cleanly and the buds should be juicy and firm. You can prick the stalk with your fingernail to ensure it is crunchy in texture but not hard. 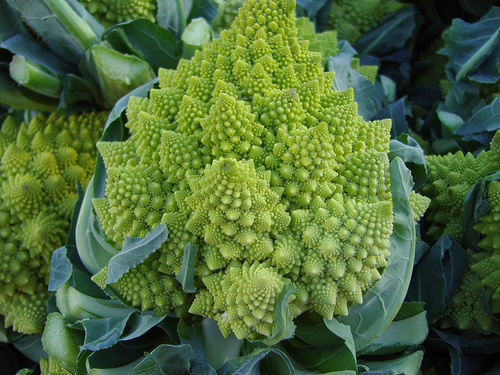 Broccoli / Calabrian broccoli (Cavolo broccoli ramose / Broccoletti) (Brassica oleracea italic forma cimosa) is the most common type known in the West. It resembles a tree with a large green head. Broccoli is harvested from September until December. Store: Broccoli can be stored in a plastic bag in the refrigerator for a couple of days. Prepare: Broccoli should be washed well and soaked for half an hour in cold water to remove any insects and sand. Cut off the hard bottom end of the stalk. The florets of the broccoli should be removed from the stem with a paring knife and should be further broken into similar sized pieces. The stem can be peeled (with leaves removed and discarded), chopped or sliced, and cooked. 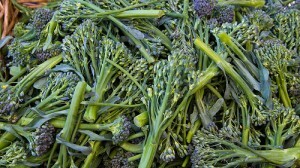 Broccoli can be steamed or sautéed but should be bright green when cooked. Care should be taken not to overcook broccoli as it turns dark green, goes limp, and develops an unpleasant smell. Eat: Broccoli can be eaten raw or cooked (steamed, sautéed, or boiled). Broccoli is eaten on its own in a side dish, on pizza with sausage, used in soups, or is incorporated into a pasta dish like orecchiette and broccoli. Broccoli pairs well with garlic, chilli, olive oil, butter, lemon, Parmigiano-Reggiano cheese, olives, capers, marjoram, parsley, and oregano. 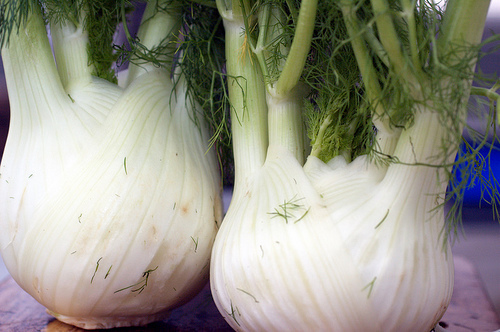 Fennel is a native vegetable to the Mediterranean. 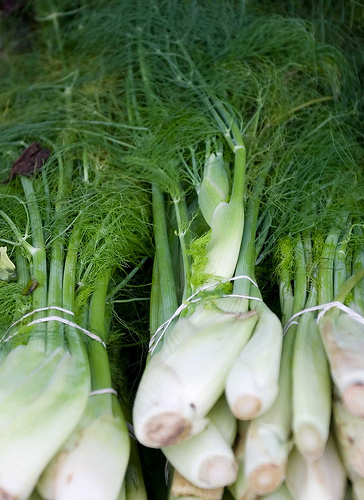 Fennel is harvested from September through April but the season depends on where it is grown. The varieties are typically named after where it is grown, for example “Gigante di Napoli” is from Campania, “Mantovano” is from Mantova, “Grosso di Sicilia” is from Sicilia, “Dolce di Firenze” is from Firenze, and “Finocchio di Parma” is from Parma. The Wadenromen variety is slightly oval in shape and is very sweet. Fennel is said to sweeten the breath and calm flatulence so it was historically served at the end of a meal in Italy, as the seeds are in India today. Buy: Fennel is white to light green in colour with a bulb with concentric layers similar to an onion except with no paper-like skin on the outside. It has a liquorice-like aroma. The bulbous root of the fennel, the feather-like leaves similar to dill, and the seeds are the parts that are typically eaten. The bulb should be firm, tender, compact, and crunchy without any cracks or signs of bolting. Fennel which has started to yellow or has elongated brown streaks is past its prime. The outer layers are unlikely to be blemish free and will be removed in any case, but evaluate whether the interior layers are pristine. The fennel fronds should be feathery and not wilted or wet. Cultivated fennel is fatter, rounder, sweeter and larger (grows up to 12cm in diameter) than wild fennel. The female fennel bulbs are fatter and sweeter while the male fennel bulbs are flatter and more fibrous. The oval-shaped fennel are better for cooking while the more rounded are best for eating raw. Wild fennel are more elongated, slightly bitter in flavour, and smaller (grow up to 5cm in diameter) than cultivated fennel. It grows wild and is often growing next to roads. 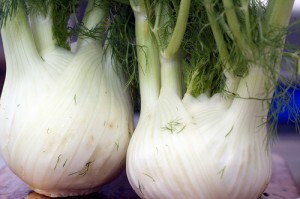 It is much more aromatic that cultivated fennel due to its essential oils and it has yellow flowers during the summer. It is a characteristic flavouring in Sicilia, Calabria, Puglia, and Sardegna. Store: Store in a plastic bag in the refrigerator for 3 to 4 days. It cannot be frozen. Fennel fronds can be kept wrapped in a damp kitchen in a plastic bag in the refrigerator. Prepare: Prepare the fennel just before cooking as it discolours when cut. Remove the stalks and tough outer layer layers and trim 1cm off the base of the fennel. 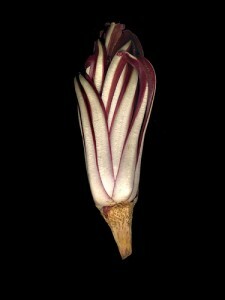 If the fennel bulb is large, taste the core to see if it is tough or stringy, and if so, cut it out. These parts can be discarded or used to stuff fish or meat for roasting or baking, create a bed under roasting meat, in stock, or in court-bouillon. The fronds can be reserved and used in salads, stuffings, or used to stuff fish or lamb for grilling or baking. Quarter or slice the bulb and rinse well between the sections to ensure there is no soil. Eat: It pairs very well with fish. Italians eat it raw, thinly sliced and dressed with olive oil (finocchi in insalata), whole after a meal like fruit, in crudité (pinzimonio) or in a salad (insalata di finocchi e olive). Fennel does not pair well with vinegar though so it is usually omitted when fennel is used in salads. It can be boiled and baked au gratin (finocchi gratinati), braised (finocchi al latte), steamed, sautéed (finocci alla giudia), stewed (finocchi al burro e formaggio, finocchi in tegame), grilled, breaded and deep-fried (finocchi dorati), in risotto (riso coi finocchi) or made into flans (sformato di finocchi). Wild fennel is used as an aromatic in grilled dishes (branzino allo spiedo con finocchio selvatico) or in griddled dishes (branzino ai ferri con finocchio selvatico) and fish soups. Wild fennel is also used to dress pastas (pasta con le sarde), flavour soups (macco), flavour breads and flatbreads, flavour boiled chestnuts (ballotta), flavour roast or barbecued meat (porchetta, fegatelli), flavour cured meats (finocchiona), make relish (rosamarina), make preserves (caroselle sott’aceto), in stuffings (maiolino al forno), in casseroles (pollo in porchetta, coniglio in porchetta), and are roasted and served on bread (crostini di barbe di finochio selvatico). Fennel partners well with olive oil, butter, bay leaf, parsley, fennel seeds, orange, lemon, saffron, tomatoes, potatoes, olives, garlic, Parmigiano-Reggiano cheese, and goat cheese. There are several varieties of green beans but there is not much distinction in terms of flavour. The green bean is in season from June through September. The “di Santa Anna” variety from Tuscany are more suited to salads and the “a corallo” are a yellow variety that is frequently cooked with tomato and onion. 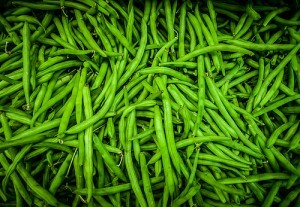 It is a good source of potassium, calcium, phosphorus, and vitamins A and C.
Buy: The green bean is a summer vegetable which can be green, yellow, or purple. It can be sold fresh, frozen, or preserved in vinegar. The best bean is fresh, young, tender but firm, smooth, slender and blemish-free. Select beans up to 8 mm in width and which are relatively straight. It should be crisp but not hard and should snap when bent backwards and spray a bit of juice (although the haricot vert variety will not do this). To test if the bean is young, snap off the end where the bean attached to the vine and drawn down towards the end, if there is no string and the end snaps off clean, it is young. A green bean become soft when too old and will have visible bumps if left on the vine too long. Select beans which are the same thickness and length so that they cook uniformly. Store: Green beans can be kept wrapped in a plastic bag in the drawer of the refrigerator for up to three days. Prepare: Rinse under cold water, rubbing the beans with your fingers, and cut off the top 1 cm of the bean where it was attached to the vine. If you snap the end of the bean off where it attaches to the vine and a string appears then you will need to pull the strings off all the beans by snapping the vine end of the bean and drawing down along the seam towards the tail of the bean. If the beans are longer than 8 cm in length then also cut off the tail of the bean. Eat: Green beans can be boiled in salted water or steamed. I normally steam them to retain as many nutrients as possible. 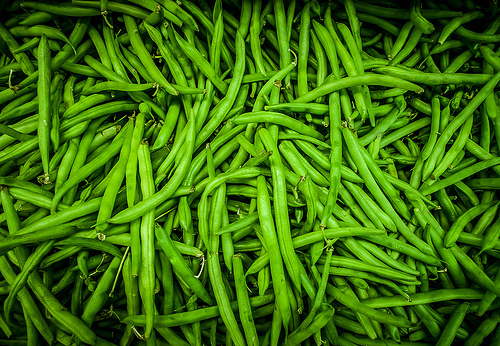 Traditionally green beans were boiled until soft, about 20 minutes. Today they are usually cooked until no longer raw but are still crunchy, about 6-7 minutes in boiling water if young. Do not cover the pot when boiling as this discolours the beans. Taste the bean to cook to the preferred texture. To lock in the colour after cooking, shock the beans by placing them in ice water for 10 minutes to stop the cooking process. Green beans are boiled and added to salads (fagiolini in insalata) or dressed with butter (fagiolini al burro), garlic oil (fagiolini in padella), garlic and anchovy oil (fagiolini alla genovese, cornetti in salsa), cream and Parmigiano-Reggiano cheese (fagiolini alla Milanese), tomato and fennel seed (fagiolini alla Fiorentina), vinegar, or cream (fagiolini alla panna). Very young beans need not be parboiled before being added to a dish. Green beans can be sautéed (fagiolini a corallo, fagiolini di Santa Anna), added to meat loaf (polpettone Genovese), added to pasta dishes (trenette al pesto), or stewed (fagiolini a pomodoro). 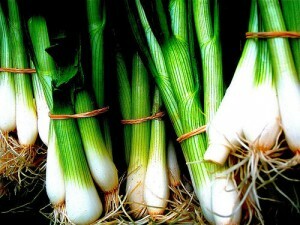 Leeks are in the onion family but have a more delicate flavour than onions. 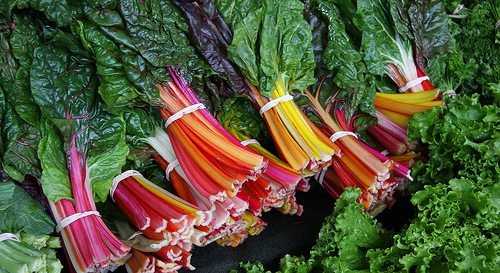 They are in season from October through March, depending on the variety. 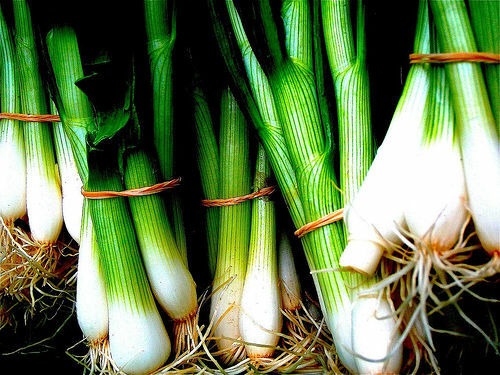 Some of the best varieties are winder leeks such as “Caretan”, “Gigante d’Italia”, and “Gigante d’inverno”. Buy: Leeks should be purchased with the greens attached so it is easier to determine freshness. Look for leeks that are straight and have the greatest proportion of white to green, as it is the white part (porrina) that is edible. The proportion varies with different varieties. If you are using the leeks for broth, this ratio is not important. The white part should be unblemished, unwilted, tender, and plump. If they are bulbous this indicates that they are over-mature which means they may have developed tough or hollow centres. There should be no yellowing to the leek. The green part should not be ripped and look fresh. The winter varieties have more flavour but are tougher whereas the summer varieties are more delicate and tender. Store: Leeks can be stored in a plastic bag in the vegetable drawer of the refrigerator for a week. 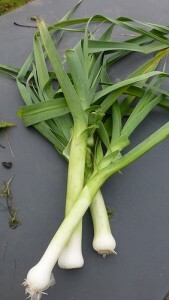 Prepare: If the outer leaves are yellowed or the leek is very large, peel off the outer layers and discard. Cut off the root and cut the leek 5 cm above the white part. The top and the root can be washed and used for soup or broth. 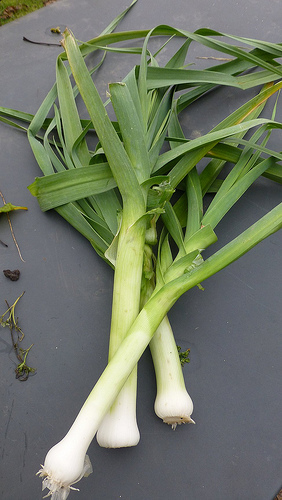 Leeks have a lot of sand and dirt between their leaves which needs to be washed out. To chop leeks, cut it up first and then wash. Otherwise, slice lengthwise halfway through the leek, leaving the leaves attached but allowing you to wash in between the lawyers. Place them in a basin of water and soak for 15 minutes. Then hold the leeks gently under running water. 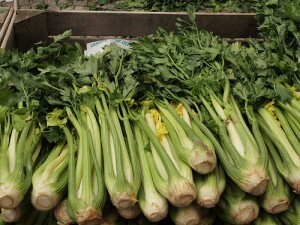 Eat: Leeks are typically boiled and dressed (porri con la besciamella), sautéed, braised, in omelettes, in pastas (tagliatelle al latte), with polenta (polenta e porri, polenta nera con bagna bianca), or used in soups (minestra di riso, porri e bietole), or stews. Leeks pair well with butter, olive oil, cream, Parmigiano-Reggiano cheese, goat cheese, capers, wine, olives, thyme, parsley, saffron, potatoes, fennel, celery, and eggs. 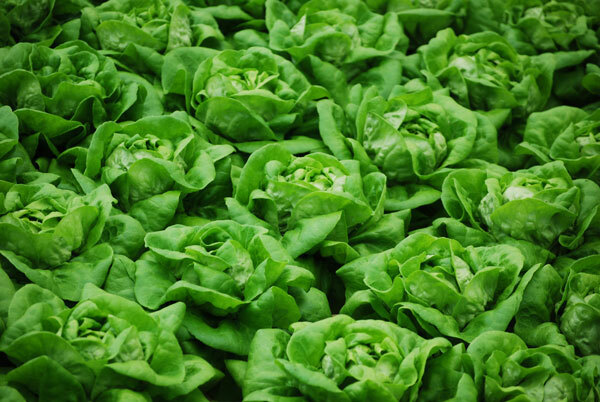 The name for lettuce in Italian, lattuga, derives from the word for milk, latte, since when the plant is cut, it oozes a white liquid resembling milk. There are hundreds of varieties of lettuce but they tend to be categorised in to three categories (see below under types). 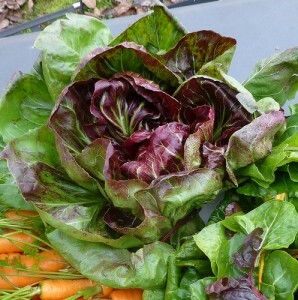 For chicory lettuce- see Chicory. 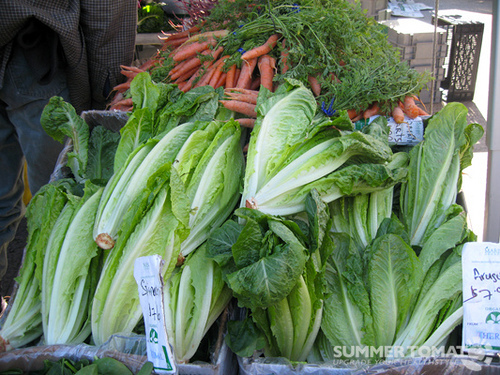 Different varieties of lettuce are in season year-round. 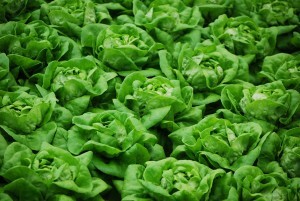 Lettuce is rich in Vitamins A and C, calcium, iron, and fibre. Buy: Lettuce is a vegetable which is sold fresh in whole heads or in loose leaves in bags. The best lettuce is sold in heads although the bagged loose-leaf lettuce is more convenient as the leaves are already washed and ready to use. There is an on-going debate about the safety of bagged lettuce due to bacteria present and chemicals used in the packaging. Lettuce should look fresh and crisp. The leaves should not appear wet, wilted, or yellowed. 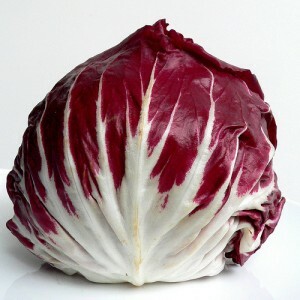 Round lettuce / Cabbage lettuce / Head lettuce (Lattuga cappucce) (Lactuca sativa var. capitata) form a crisp, compact head of large, round, concentric green leaves of lettuce with a crisp, light yellow heart. 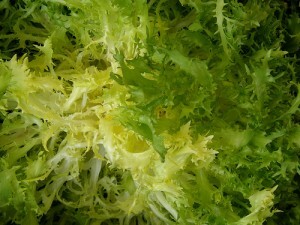 Varieties include butterhead (Regina di Maggio, Cavolo di Napoli, Meraviglia d’inverno, Meraviglia delle quattro stagioni), iceberg / crisp head (Regina dei ghiacci), and Boston (Trocadero) varieties. Different varieties grow in different seasons and some grow year-round. Romaine lettuce / Cos lettuce (Lattuga romana) (Lactuca sativa var. longifolia) has elongated leaves which can grow up to 50 cm in length. Romaine is in season year-round. 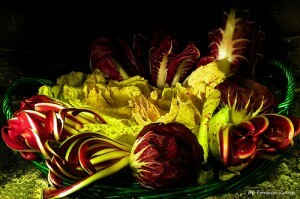 Varieties include “Bionda degli ortolani”, “Verde d’inverno”, “Rosso d’inverno”, and “Balon”. 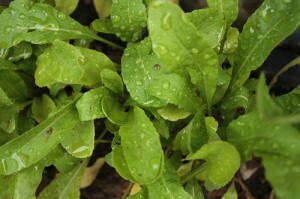 Leaf lettuce / Loose-leaf lettuce / Cutting lettuce (Lattuga da taglio) (Lactuca sativa var. crispa) forms a rosette or is comprised of frilled leaves with no distinguishable head. The leaves can be green or green and red together. The most common varieties are “Riccia verde da taglio”, “Riccia bionda d’Australia”, “Rossa di Trento”, “Ubriacona frastagliata”, “Ciucca”, “Bionda a foglia liscia”, and oakleaf “Biscia rossa”. 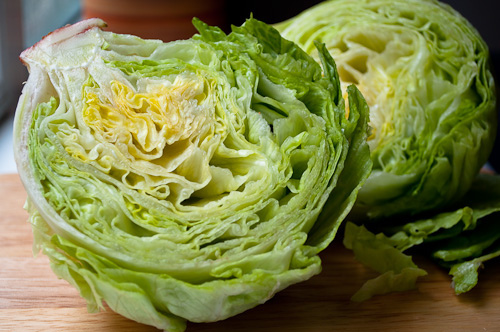 Store: Lettuce is highly perishable and needs to be refrigerated packaged in a plastic bag or rolled in a kitchen towel in a drawer. 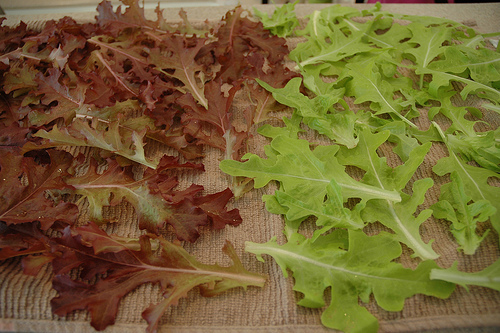 Leaf lettuces will keep for 4 days, romaine lettuce for 10 days, and iceberg lettuce for up to 2 weeks. Prepare: Remove the leaves from the head and place in a large bowl. Discard the outer leaves if they are tough, wilted, yellowed, or blemished. Soak lettuce in cold water for 10 minutes and then rinse with cold running water, rubbing the base of the leaf to remove any dirt. They can be dried in a salad spinner or wrapped in a kitchen towel, gather the edges in one hand, and roll your arm around fully extended to spin dry. The leaves are normally torn rather than cut. Never wring or press the leaves. Do not dress lettuce until serving as the leaves will go limp. Eat: Lettuce is normally eaten in salads in Italy, typically dressed at the table rather than a dressing prepared in advance. Salads are dressed with olive oil, nut oils, linseed oil, grapeseed oil, or rapeseed oil with vinegar or lemon juice. 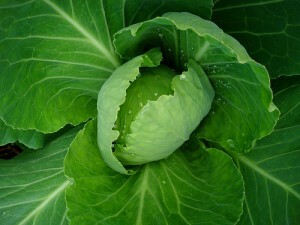 Lettuce can be cooked but this reduces their vitamin content. Romaine lettuce can sometimes be cooked, typically boiled (lattuga lessata), braised (lattughe ripiene in brodo), or in soups (zuppa di lattughe ripiene). A mushroom grows underground in symbiosis with tree roots and is invisible to the eye. Left undisturbed the mushroom plant can live for 10 years at the right temperature and humidity. The capped stalk we think of as a mushroom is the fruit of the plant. There are more than 35,000 varieties of mushrooms which come in all shapes and colours. 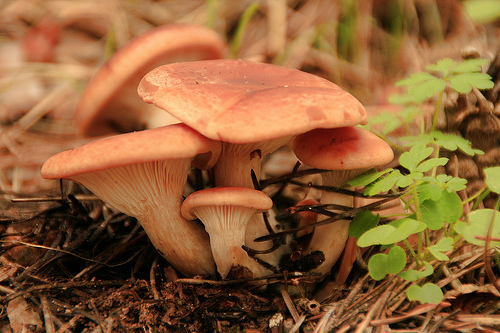 Many varieties of mushrooms are poisonous so only experts should pick wild mushrooms. The most prized Italian varieties are porcini and royal agaric. Mushrooms are rich in potassium and have phosphorus, calcium, and iron. Buy: Mushrooms are sold fresh, dried, frozen, preserved in oil (funghi sott’olio), preserved in vinegar, or tinned in water. I do not recommend mushrooms tinned in water. Mushrooms should be plump, dry, clean and firm. If the gills are open, they should look fresh and not be wet or matted down. Buy fresh mushrooms which don’t have a bad smell, the skin is not darker than usual, wrinkled, or blemished, and does not seem dried out, full of water, sticky, or slimy. Dried mushrooms, particularly porcini, are excellent but generally used differently than the fresh ones. Dried mushrooms should have a strong scent. The larger and more intact the slices, the more expensive, but it is also easier to detect how long they have been on the shelf. If the dried mushrooms are crumbly, they are too old. Store: Place mushrooms in a closed, brown paper bag or wrapped in a slightly damp towel, in the refrigerator (not in the vegetable drawer) for up to seven days (for variations to this see the specific mushroom type). Do NOT put them in a plastic bag or they will become slimy. They are delicate in that they are susceptible to drying out if not covered properly but also will be come soggy and decay if exposed to too much moisture. Mushrooms can be thinly sliced and dried under the sun, but need occasional turning. Do not try to preserve mushrooms in oil or vinegar at home as there is a risk of botulism. They can be successfully frozen but the texture deteriorates. Storage times vary according to the variety, so see the types below. Dried mushrooms should be kept in a cool, dark, dry container which is air-tight. Prepare: Wipe away any dirt with a damp cloth (NEVER wash mushrooms as they soak up water which dilutes their flavour). Trim any damaged spots and tough stems. Check the variety under “Types” below to see if the stalk is used or reserved for broths. Dried mushrooms can be rehydrated in warm water for 20 minutes before using. Eat: See specific types. Mushrooms preserved in oil are served as a starter. Only porcini, button, and Caesar’s mushrooms are eaten raw in salads. Mushrooms are grilled, baked in parchment, sautéed (funghi trifolati), used in soups and stews, and used to dress pasta (pasta con funghi al pomodoro), polenta, and risotto. Mushrooms pair well with butter, olive oil, garlic, parsley, lemon, rosemary, tarragon, onions, leeks, potatoes, barley pine nuts, wine, and rice. Button mushrooms are cultivated and so are ubiquitous (and cheap). Buy: There are two types of button mushrooms- the white ones (also called button, domestic, cultivated) and the brown ones (also called chestnut, cremini, Italian field, and the very large ones, Portobello). The brown button mushrooms have slightly more intense flavour than the white ones. They range in size so select the size based on the cooking preparation. The smaller button mushrooms which still have enclosed gills are good for eating raw. The newly opened button mushrooms are good for preserving under oil. The medium-sized button mushrooms are good for making into sauces and sautéeing. 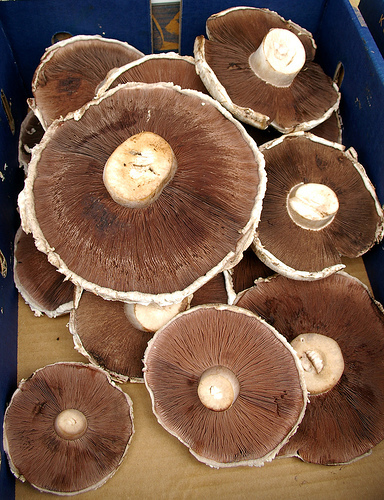 The very large brown mushrooms are sold as “Portobello” mushrooms and are best grilled or roasted. It is best to buy them loose so they can be inspected individually. Button mushrooms can be sold fresh or preserved in oil. Prepare: Wipe away any dirt with a damp cloth. Remove the stem and save for broth. If the mushrooms are very dirty, you can rinse quickly in cold water but it is not ideal. Button mushrooms will oxidise after they are brushed so particularly if they are to eaten raw, sprinkle lemon juice on them after rubbing or slicing to prevent them turning brown. Typically the stem is removed and discarded or reserved for making stock. Eat: These mushrooms can be used in most mushroom dishes. They are good to mix with dried porcini mushrooms when fresh porcini are not available or prohibitively expensive. Button mushrooms can be thinly sliced and eaten raw as a salad (insalata di champignon crudi), deep-fried (fritti dorati), made into a paste to dress pasta (tonnarelli alla paplina, alla boscaiola) or pizza, grilled, roasted, or sautéed (trifolata). The Italian name “ovolo” is derived from the Italian word for egg, “uovo”, as the Caesar’s mushroom when very young is encapsulated in a white veil similar to an egg. As they grow it changes shape from spherical and closed to flat and open. 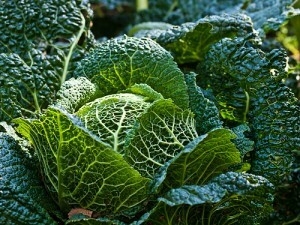 They have been prized since the days of ancient Rome and were called the “food of the Gods”. Caesar’s mushrooms are very rare and so are expensive. It also grows in Sichuan province. 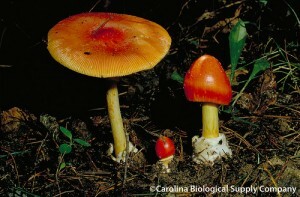 Be careful as the poisonous Amanita muscaria mushroom resembles the Caesar’s mushroom. 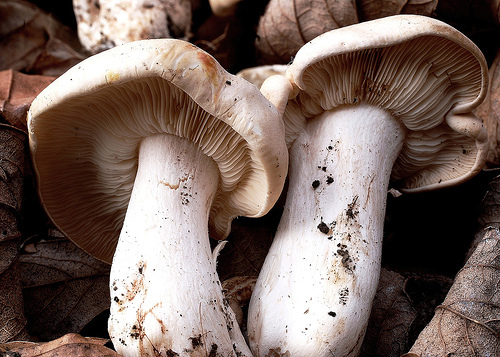 Buy: Caesar’s mushrooms have a distinctive orange cap, yellow gills, and white stalks. The flesh is white. 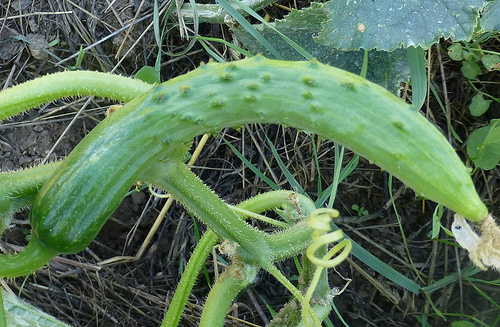 The can can grow up to 20 cm in diameter and the stalk can be 10 to 15 cm in length. The very young, closed or semi-closed Caesar’s mushrooms are particularly prized and are eaten raw. Store: Store for no more than 2 days. Prepare: Wipe with a dry cloth. 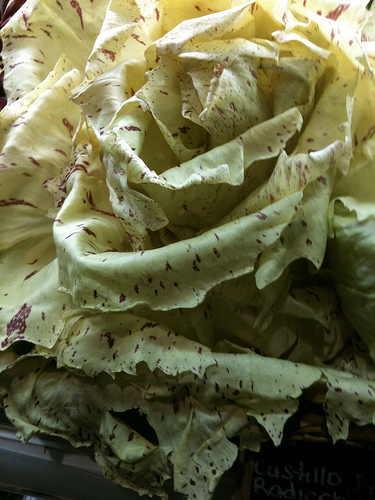 Eat: They are best eaten raw thinly sliced as a salad (ovoli in insalata) or on top of carpaccio. The open Caesar’s mushroom are cooked, typically preserved in oil, in soup (zuppa di ovoli), or baked with a breadcrumb topping. Chanterelles have a strong flavour which I love. They are one of the most popular mushrooms in Europe. 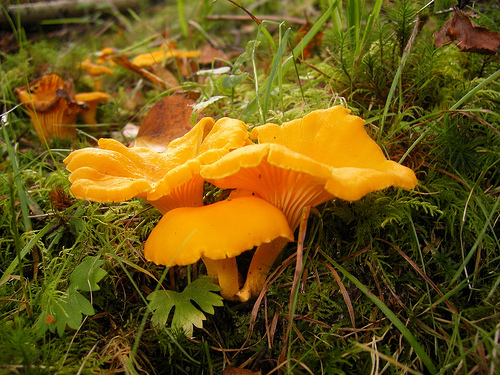 In Liguria, there are many recipes using chanterelles. They are in season from late summer through autumn. Buy: They can be yellow or white in colour and have a compact, meaty, funnel-shaped cap that ranges in size from 4 to 10 cm. The stem is the same colour as the cap and is compact and thick. The flesh inside is white with a spot of yellow. Try not to buy chanterelles which have broken into pieces or have too much sand in them. 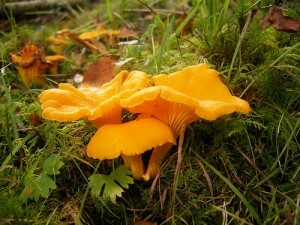 Chanterelles are also sold preserved in oil, dried, and frozen. Fresh are best. Store: Chanterelles are hardy and can stay in the refrigerator for 8 to 10 days. Prepare: Chanterelles can be difficult to clean. Brush with a damp cloth and unless very dirty, do not rinse with water. Add chanterelles later in the cooking process so they do not toughen. Eat: Chanterelles are excellent in risotto, pasta (spaghetti al sugo di funghi cantarelli), sauces, and stewed as an accompaniment to meat such as chicken or beef cheek (guancia di manzo con patate e finferli). They pair well with eggs, garlic, and parsley. The funnel mushroom is in season during the autumn. Buy: The funnel mushroom can grow to more than 10 cm in diameter and more than 15 cm in height. It has a funnel shaped cap and is white or yellowish in colour. It is very meaty in texture and flavourful. 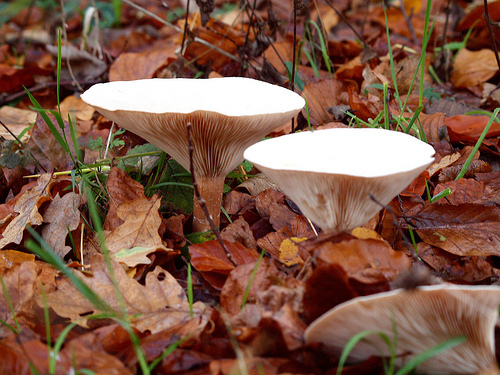 Common Funnel (Cimballo / Imbutino) (Clitocybe gibba) is white in colour. Trooping funnel / Monk’s head (Cimballo) (Infundibulicybe geotropa / Clitocybe geotropa) is yellow in colour. Store: Keep in the refrigerator for up to 3 days. Prepare: The stem is hard and needs to be removed prior to cooking. Eat: It is commonly used in sauces and soups. It can also be fried and preserved in oil. The Italian name, chiodino, derives from the word for nail, “chiodo”, in reference to the shape of the mushroom. The honey armillary mushroom grows in bunches on logs or tree stumps in the autumn. Their flavour varies depending on what type of wood they grew on. The honey mushroom is abundant as it can be cultivated so its price is relatively low. 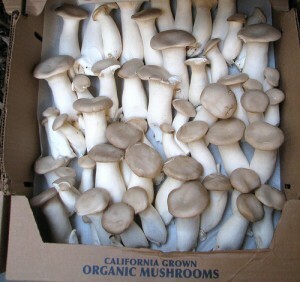 Buy: When the honey armillary mushrooms are young, they have a semi-spherical cap which then grows larger as they mature. At medium maturity the cap is still conical and when it is very mature it flattens around the edges and maintains a raised point in the centre of the cap. They also start out a rosy colour with a reddish hue and then turn brown when mature. The gills are white, sometimes flecked with red and the flesh is white. The stem is slightly curved and can grow up to 15 cm in length. They are sold fresh and preserved in oil. Prepare: Cut off the stalk and throw away or use for broth as they are fibrous in texture. Honey armillary mushrooms can become viscous when cooked, parboiling them beforehand is a way to avoid this, although this can mean they lose their flavour. 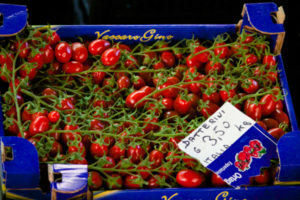 Eat: They are best stewed with tomatoes (chiodini in umido col pomodoro) or garlic and parsley and served with polenta. In Lombardia they are cooked with duck, rice, guinea fowls, pork ribs, or preserved in oil. 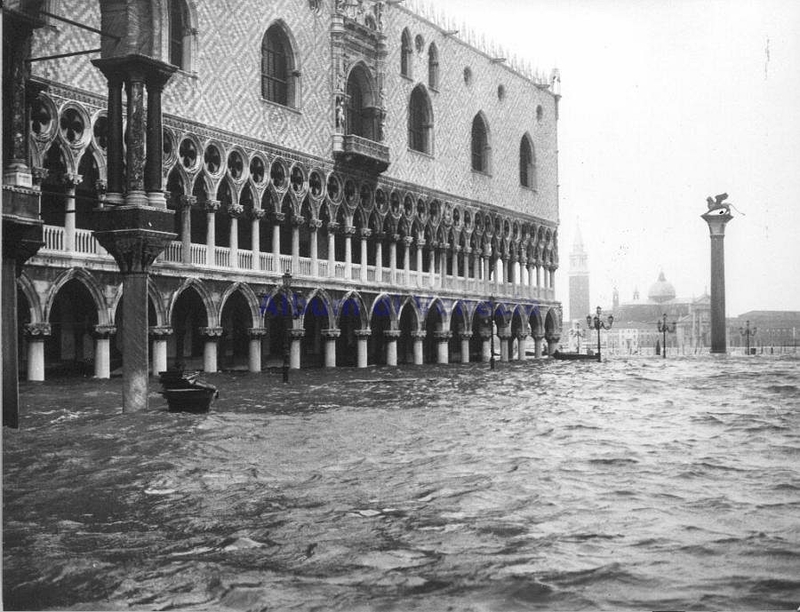 They are also popular in Veneto. In Veneto and Piemonte, the sauté honey armillary mushrooms with in olive oil with garlic and chopped parsley (funghi trifolati). Morel is in fact more of a fungus than a real mushroom. 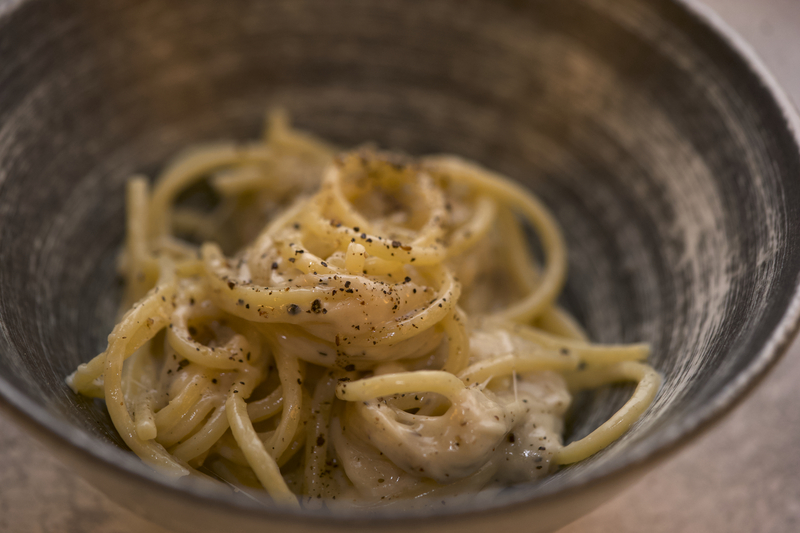 They are usually only found in traditional Italian cooking in Emilia, specifically Modena. Morels are one of my favourite mushrooms. Unfortunately they can be expensive, though it should be noted they are more prized in France than in Italy. 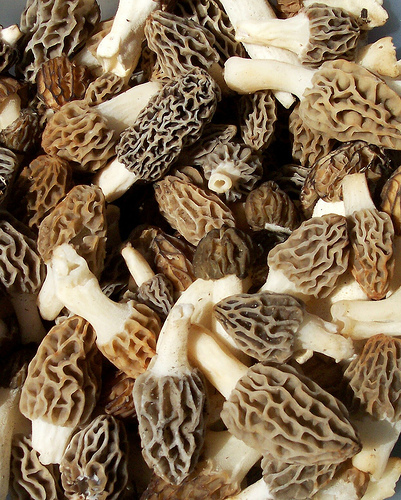 Buy: Morels have an oval, conical or elongated cap that are 5 to 13 cm tall that are spongy in texture. They have a hollow stem, range in colour from tan to brown to grey or black. The best morels are black or brown with a larger oval head in relation to the stem. They are sold fresh or dried, which are also very good. Prepare: Prepare just before cooking, as morels are highly perishable. As they have a spongy texture they are difficult to clean. Ideally, just wipe them with a cloth or brush away dirt with a stiff brush. If you must rinse them in water, the flavour will suffer. Eat: In Modena, morels are used to dress pasta (tagliatelle, lasagne Bianca con le spugnole) or cooked with cream on their own (spugnole alla crema). These mushrooms are cultivated and so are ubiquitous (and cheap). They are used in a lot of recipes in Puglia. They have a delicate flavour. Buy: Oyster mushrooms have fan-shaped caps which taper off into their stems. They normally grow in a cluster on stumps, logs, or branches of hardwood trees. They range in colour from pale brownish grey to brownish black. The flesh is white, thick, and soft. The stems are short and tough and the gills are white. It is preferable to buy younger ones as they tend to be more tender, as oyster mushrooms mature they can toughen. King trumpet mushroom / French horn mushroom / King oyster mushroom / King brown mushroom / Boletus of the steppes / Trumpet royale (Cardoncello / Cardarello / Cardarella) (Pleurotus eryngii ) This variety has a thick stem with a funnel-shaped meaty cap. It is the most common mushroom in Puglia and Basilicata. Prepare: Wipe away any dirt with a damp cloth. Cut off and discard the stem or save for broth. 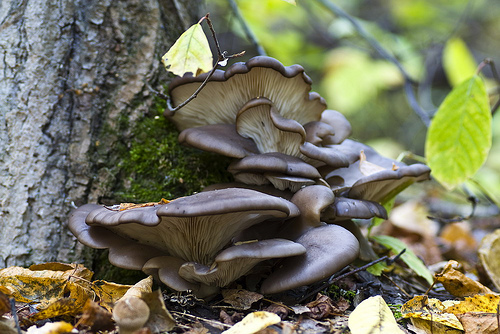 Eat: This variety can be used in most mushroom dishes. They are normally stewed, broiled, or preserved in oil. King trumpet mushrooms are gratinéed (cardoncelli gratinati) or cooked with tomatoes (cardoncelli al pomodoro). Porcini are in season from late summer through autumn. They usually grow under oak, beech, chestnut, fir and pine trees. There are many varieties of porcini mushrooms, but not all of them are good. 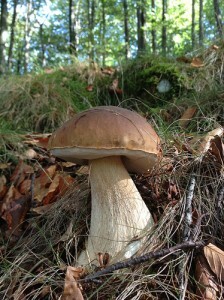 The king of the porcinis is the boletus edulis, also known as the common porcini. The best ones are grown in Calabria, Campania, and Piemonte. Porcini mushrooms, together with Caesar’s mushrooms, are one of the great mushrooms of Italian cooking and often command a high price. They have a flavour unrivalled by other mushrooms and have a meaty texture. Buy: Porcini have rounded or flat caps ranging from 5 to 30 cm in diameter with a stalk that can be 20 cm or longer in length and 2 to 5 cm in diameter. Look for smaller, compact and elastic porcini with a hazelnut-coloured cap and a short stalk, indicating that they are a younger and of higher quality. If, however, the intention is to roast or grill, slightly more mature mushrooms are preferable. They should not be sticky. The meaty cap has white or yellow or dark brown pores underneath, rather than gills like other mushrooms. Look for mushrooms which have white or light yellow pores. A mushroom past its prime will be flaccid in texture, have a large cap, a long stem, and thick pores under the cap with a greenish tinge. While the varieties of porcini range in colour from white to brown or dark grey with blackish purple tones, the flesh inside is white. The best porcini will still have a brown cap. Porcini grown in North Africa tend to have a lot of sand in them requiring them to be washed thoroughly, therefore compromising the flavour. Porcini are sold fresh, frozen, or dried. Dried porcini offer a more intense flavour so are valued independently. Select dried mushrooms which are creamy in colour and are not dark, crumbly, or have signs of pests. Tiny pieces of dried porcini may be gritty so try to buy larger pieces. They should be light cream in colour with some dark patches and should have a strong scent. Bolete (Porcino nero / Bronzino) (Boletus aereus) havea dark brown cap with a stalk with a dark net-like appearance. The pores range from greyish white to yellow. Pine bolete / Pinewood king bolete (Porcino rosso/ Porcino dal gambo rosaceo) (Boletus pinophilus) have a brown cap with tones of red and purple but the flesh is white. The stalk is fat with a purplish hue. Porcino / Cep (Porcino comune) (Boletus edulis) is the most common variety and the cap ranges in colour from white to chestnut colour. The stalk is white and more slender. It is the most prized. Summer cep (Porcino estivo / porcino reticolato) (Boletus reticulatus) have a very fat stalk with a net like appearance and are not as firm as other porcini. Store: Store for no more than 2 days. Porcini can be frozen although this may affect their texture. Prepare: These mushrooms are quite large and their stems are eaten. Normally porcini are simply brushed with a dry cloth and the pores inspected for parasites. Thick pores can be trimmed. If the porcini are very sandy then they will need to be washed in water. Peel the stems with a mushroom peeler or small knife and cut off the end which grows in the ground. Cut the stems from the stalk. Finely slice the stems and the stalks, keeping separate. Dried porcini need to be soaked for 20 minutes in warm water before using (strain the soaking liquid to remove the grit and use as broth in cooking). Eat: Porcini are good raw thinly sliced (porcini crudi) or cooked. They are excellent in starters, soups, salads, pastas, risotto, polenta, stuffed pastas, in omelettes, in sauces, with meat, used in stuffing, and on their own- especially grilled (porcini alla griglia), deep-fried (porcini fritti, porcini impanati), stuffed (porcini ripieni), baked (cappelle di porcini al forno) or fried (porcini trifolati). 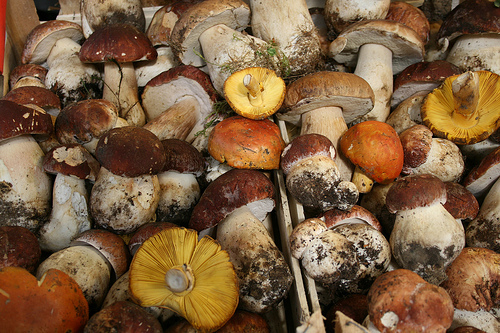 Many dishes in Liguria use porcini mushrooms. 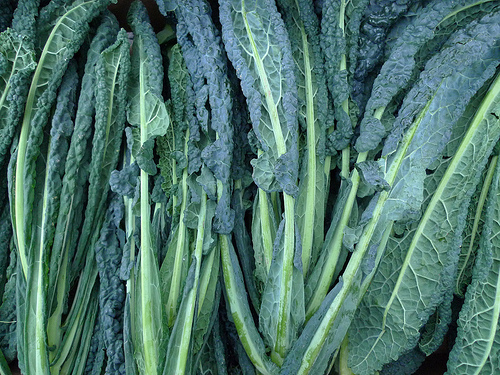 These are valued for their flavour and are used in many recipes in Liguria and Calabria. Buy: Saffron milk-caps have an orange convex cap that ranges in size from 4 to 14 cm in diameter. They sometimes have dark orange lines in concentric circles on the cap. 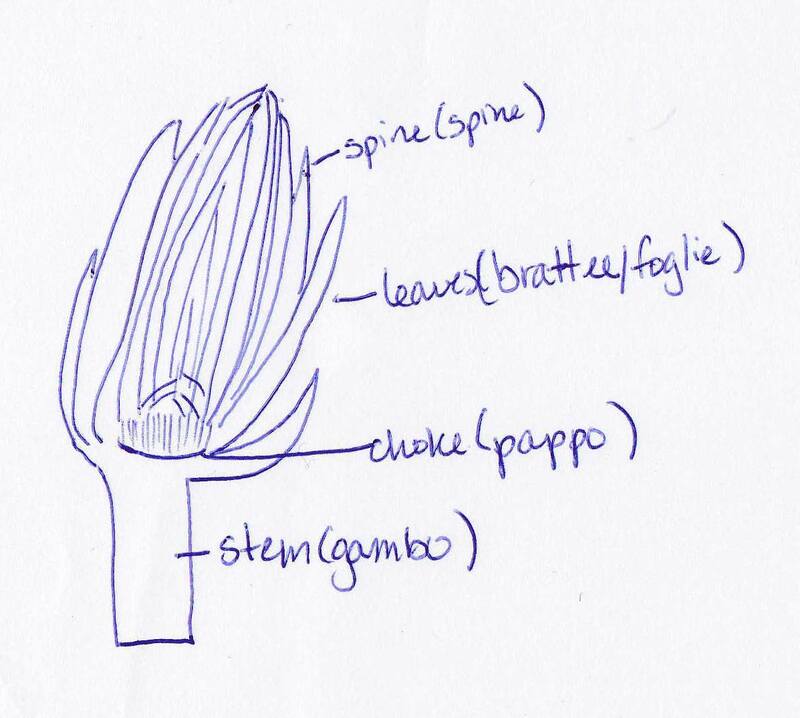 The stem ranges from 1 to 2 cm in diameter and 3 to 8 cm in length. When cut, the mushroom will exude an orange coloured “milk”. Eat: They are normally fried or sautéed and pair well with olive oil, garlic and parsley. Typically, they are paired with strong flavourings. St. George’s mushroom is in season in the spring and is highly prized. It is used in many recipes in Molise. Buy: It has a firm, meaty light brown or whitish cap which grows to 5 to 10 cm in diameter. When young, the St. George’s mushroom’s cap is semi-spherical in shape and smooth when mature. It has a large stem which is 1 to 2 cm in diameter and up to 3 to 7 cm in length. The flesh is firm and white. Eat: They pair well with tomatoes, and are used in sauces, soups and stews. St. George’s mushrooms can also be used to dress fresh egg yolk pastas such as tagliatelle or tagliolini. Onion is the bulb of the onion plant. The bulb is built in concentric layers which come to a peak at the top. Onions are harvested at different stages in their maturity. 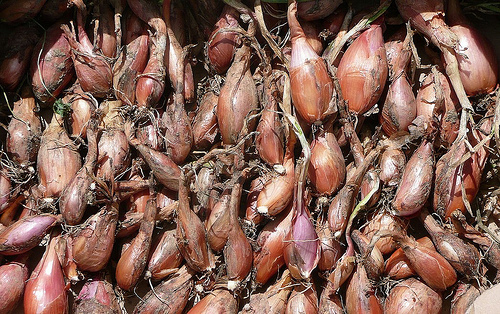 Before the bulb has formed or has just started to form, the onions are called spring onions. 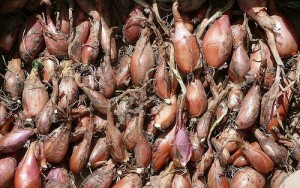 Once a small bulb has formed but before it has grown large, the baby onions are called cipolline. Full grown, mature onions are harvested from May to September and can be dried and sold year-round. They are protected by a paper-like skin and can be yellow, white, or red in colour. They can be round, elongated, or flattened. The size also varies greatly from a few grams to two kilos as there are many varieties. The red varieties are the sweetest. 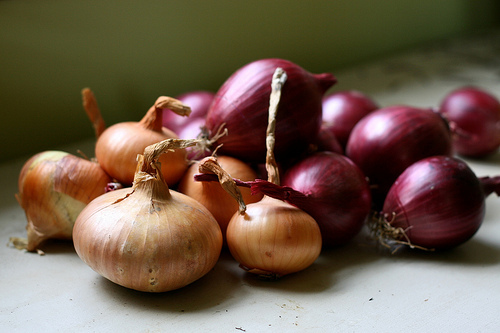 Onions are said to aid digestion and be diuretic. They are rich in potassium and contain calcium and vitamins A, C, B, B1, B2, and PP. Buy: Select the onion size for how much onion will be needed as they do not keep well once cut. Onions should smell fresh. 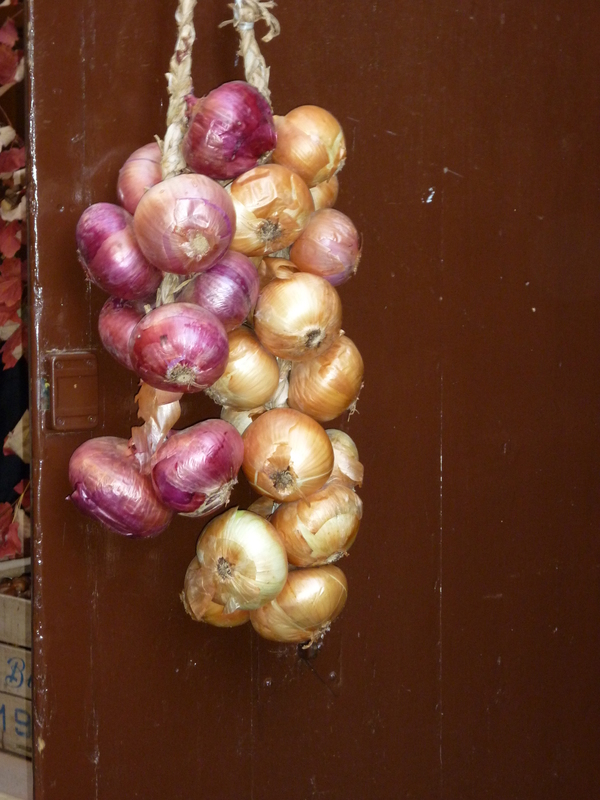 Freshly harvested onions will appear shiny and moist and will not yet have developed a paper-like outer skin. Dried, mature onions will be dry, firm and compact with no soft spots or black powder forming on them. There should be no moisture on the top or root. The stem should not appear woody. There should also be no green sprouting from them as this indicates the core has suffered. White onions should be shiny whereas the other onions should have a dry skin that crumbles easily. Spring onions should be unblemished and dry. Spring onion / Green onion / Scallion (Cipollotto / Cipolle novelle) is an immature red or white onion which has been harvested before the bulb has formed or only just begun to form. It is mild and delicate and can be eaten raw. The traditional season for the spring onion was spring through summer. It is used in salads, stuffings, and in omelettes. Baby onion / Pearl onion / Cipolline (Cipolline / Cipollette) is an immature red or white onion which has been harvested when the bulb has begun to form but is still small. The most common variety of baby onion is Borettana. The best baby white onions (cipolline) are the Brianzola variety from Lombardia. Also very good are the varieties: Precoce di Barletta, Giallognola di Como, and the Borettana. Mature onions: They are harvested in June and July for consumption during the summer at the end of the summer and autumn to be dried for use all year-round. Red onion has a red skin and layers. 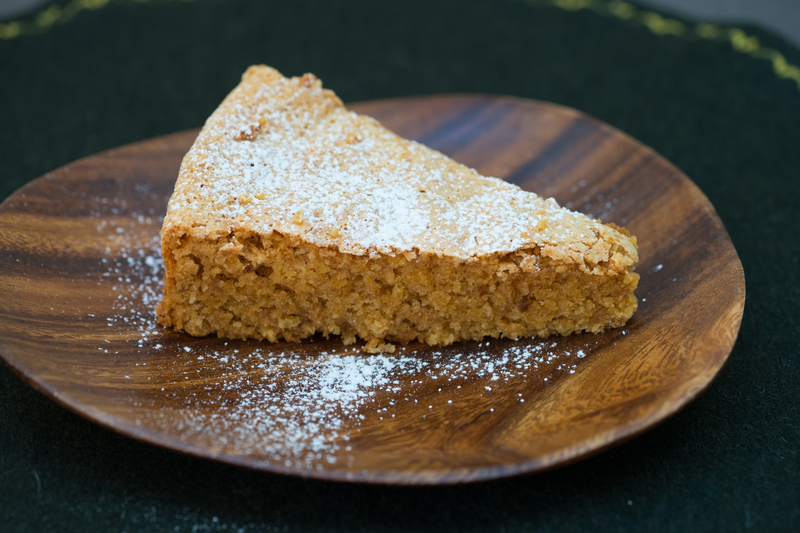 It is sweet and can be used interchangeably with Spanish onions. It is used raw or cooked. The most popular variety is the sweet Rossa di Tropea PGI. Spanish onion is a larger, slightly flatter brown skinned onion. It is milder than yellow onions. The most popular variety is Ramata di Milano. 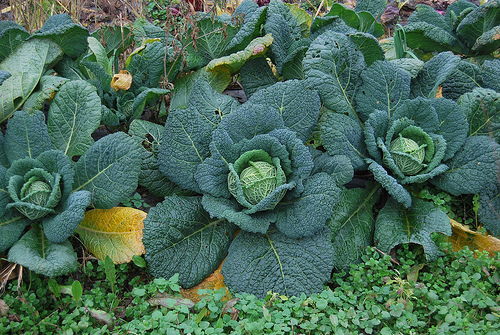 A notable variety is the Dorata di Parma. Yellow onion has a golden brown outer skin. This is the strongest flavoured of the globe onions and is a good all-purpose onion. White onion is sweeter than yellow or pink onions. The most popular variety is the Bianca di maggia. Store: Spring onions can be kept wrapped in plastic in the drawer of the refrigerator for 2-3 days. Mature onions can be kept for 10 days or more if they are stored in a cool (about 10˚C), dry, dark place with air that circulates. Do not store in the refrigerator or together with potatoes as they become mouldy. After a mature onion has been cut, keep it wrapped in the refrigerator and use it within 2 days. Mature onions which have begun to sprout green leaves are generally no longer usable. Prepare: To prepare spring onions, rinse under cold water, remove the root end and chop the entire spring onion. The green part can also be used. To prepare baby onions, parboil them first to more easily remove the skin, top and root. They are typically used whole. To prepare mature onions, if the onion has a green sprout, cut it in half first to determine if the inside has turned soft (and therefore is unusable). If not then remove the shoot and discard and use the rest of the onion. Cut onions can make eyes tear up. To prevent this, leave the onion in the refrigerator for 1 hour before chopping it or simply breathe out of your mouth while chopping. To cut an onion, remove the tip with a knife, keeping the root end in tact. Remove the papery outer layer. To slice rounds, slice down parallel to the cut end. To make slices or dice, place the cut end down on the cutting board and slice the onion in half down through the root. To make slices, place the newly cut end on the cutting board and cut off the root end. Then place the knife parallel to the uncut side and working from one uncut end to the other, slice thinly. To dice the onion, place the newly cut end down and keeping the root attached, make slices from the root towards the cut end across the onion, then turn the onion 90˚ and start dicing the onion until reaching the root. Then prepare according to the recipe but never burn onions as their flavour turns bitter. Eat: Onion is used as a vegetable and as a flavouring agent. Onions can be eaten raw in salads, in pinzimonio, with beans, with preserved tuna, or with cold cuts. 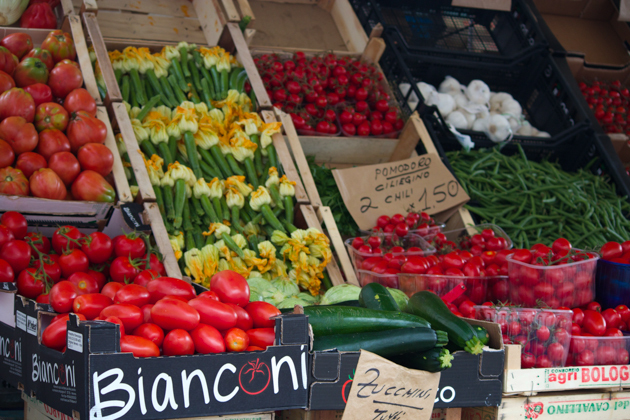 They can be roasted (cipolle al forno), fried (cipolle fritte), boiled, sautéed, and grilled. Onion, along with carrot and celery, form the base of (called soffrito or battuto) many sauces and soups. Onions can be roasted stuffed with meat and served as a starter or side dish (cipolle ripiene, cipolle ripiene con tonno), are used in soups (cipollata, carabaccia), salads, in bread (fitascetta) on top of focaccia, on pizza (pizzalandrea, pizza con cipolle), sauces (salsa di cipolle), in savory tarts, in meat and fish dishes, in omelettes (frittata spagnola), pies, in side dishes (contorni), roasted whole. As a side dish they are served with liver, salt cod (baccalà fritto alla Milanese), and braised meats (Genovese, pollo alla cacciatora Emiliano). The baby globe onions (cipolline) are pickled (cipolline sott’aceto), served in sweet and sour sauce (cipolline in agrodolce), stewed or glazed (cipolline glassate) and served with roast or braised meats, or preserved in vinegar (cipolle sott’aceto) or olive oil. They pair well with mushrooms, roasted meat, particularly veal, butter, cream, olive oil, rosemary, thyme, sage, bay leave, cloves, cinnamon, chilli, vinegar, sugar, honey, cheese, preserved tuna, beans, and potatoes. This vegetable looks like a fat grass and is juicy and crunchy. 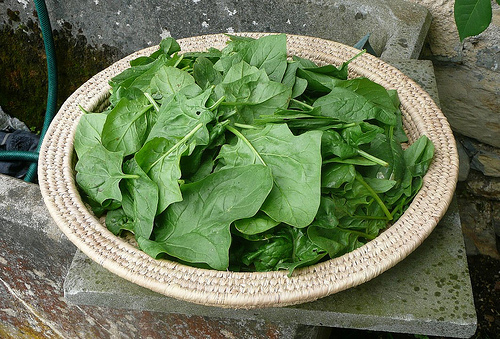 The flavour is a bit like spinach and is slightly bitter and acid, particularly when eaten raw. The texture is more similar to seaweed or samphire. It is harvested in the spring when it is most tender. Buy: Look for unwilted, dry, bright green strands. It is typically tied in bunches with the stem still attached. Ensure there are no signs of rotting. Store: Store in the refrigerator in a sealed container for 3 to 4 days. Prepare: Wash in cold water and cut off the root end. 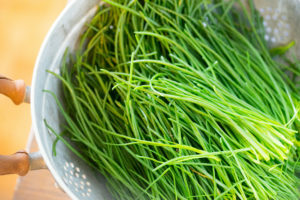 Eat: Agretti can be eaten raw, mixed into salads, or boiled quickly in salted water and dressed. Typical dressings include salt, pepper, olive oil, and vinegar or butter. I like mine with olive oil, anchovy, and garlic. It can also be used in risotto. Peas are a quintessential spring vegetable and are harvested throughout the spring and summer. Varieties of peas which are particularly sweet include: Cristoforo Colombo, Progress n.9, and Meraviglia d’Italia (the best flavoured). The best variety of mangetout is the “Caruby”. Peas are a good source of vitamins A and C, thiamine, protein, and phosphorus. 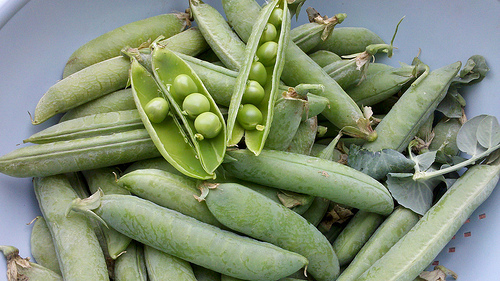 Buy: Peas which are underdeveloped are called mangetout and are eaten whole with the pod. As the peas mature, the pod is removed and the peas inside are eaten. Peas (Pisello): Peas have a cylindrical pod which is straight or curved which contain up to 10 spherical peas. Peas should be purchased refrigerated as their sugar turns to starch within 6 hours at room temperature. Select medium-sized, plump, firm, bright green pea pods where the peas have clearly formed but are not visible through the pod. Smaller peas are sweeter than large peas, which are floury and bitter. They should be crisp and free from any yellow tinges or wilting. 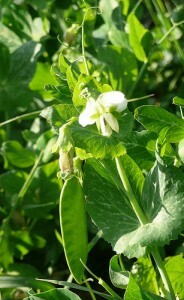 Ideally, open the pods and taste the peas before purchasing to taste if they are sweet and tender. Peas which are sold shelled are convenient but at the risk of compromised quality because the sugar in the peas quickly turns to starch after podding. Frozen peas are also very good as they are frozen the day they are picked. “Petit pois” is a very small pea which is very small and sweet. “Piselli novelli” are young tender peas. There are also tinned peas (which are inferior) and dried peas (which are not a suitable substitute for fresh or frozen peas and are not typically used in modern Italian cuisine). 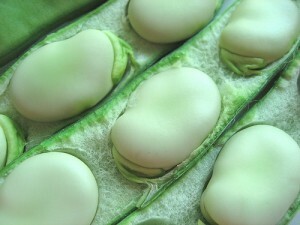 Mangetout / Snow pea (Taccola): Mangetout are larger than peas and flat. Mangetout are eaten in the Marche, Piemonte, and Lombardia. Store: Fresh peas should be used within a day of purchasing as their sugar turns to starch within 12 hours under refrigeration. They should be stored in a plastic bag in the refrigerator. If you cannot use the peas in time, they can be frozen shelled or in their pod for several months. Mangetout can be stored in the refrigerator for up to 3 days. Prepare: Frozen peas can be used directly from the freezer without thawing. To prepare fresh peas in the pod, pinch the tip of the pod and pull down along the seam to remove the string. Use your thumbs to pull the pod open along the seam and slide your thumb along the inside of the pod to dislodge the peas. The pods can be used to make broth. If the mangetout has a string, then this should be removed. Eat: Peas need to be cooked quickly in order to remain sweet and fresh. Peas are used in soups (bazzoffia, menestra de bisi spacai, lepudrida, zuppa di piselli, zavardella, pisellata, risi e bisi), pasta sauces (tagliatelle e bisi), or as a side dish (carciofi coi piselli, piselli al prosciutto, piselli con lo zafferano, vignarola). Mangetout is stewed with tomato and onion or boiled. Peas pair well with bacon, pancetta, prosciutto, speck, butter, parsley, mint, basil, garlic, shallots, onions, spring onion, asparagus, new potatoes, carrots, broad beans, chicken, lamb, duck, scallops, or fish. 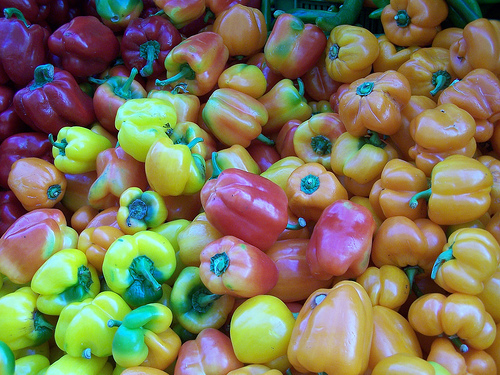 Peppers are a vegetable which can be white, orange, yellow, red, or green and varies widely in flavour, size, and shape. Peppers tend to be sweet but some of the varieties may produce the odd spicy pepper as well. 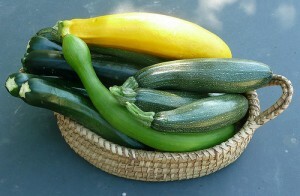 They are harvested in the summer, particularly in June. 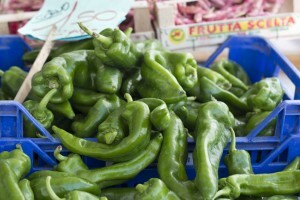 Peppers are enjoyed in Basilicata, Calabria, Lombardia, Piemonte, and Umbria. The best varieties are California wonder, Quadrato d’Asti, and Lungo Marconi. The most important pepper is the peperone corno di bue di Carmagnola from Piemonte. The best varieties for preserving in vinegar are the green horn-shaped Sigaretta verde (friarelli) and Lombardo chiarissimo. Buy: Peppers should be firm, glossy, unblemished, unwrinkled, crisp and juicy with lots of flavour. The stem should be firm and the pepper should feel heavy for its size. Peppers can be four-sided (grossum / grosso / peperoni quadrati), heart-shaped (peperoni a cuore di bue), horn-shaped (longum / lungo / peperoni a corno), and tomato-shaped (peperoni a pomodoro). In many cases, the green and white peppers are just underdeveloped varieties of red or yellow peppers. Green peppers are more acidic and less perfumed while more mature peppers will have a more intense, fruity flavour. Store: Peppers can be stored in a plastic bag in the refrigerator for up to a week, although should ideally be eaten within 2 days (10 days for green peppers and eaten within 3 days). Prepare: Rinse the pepper with cold water, cut off the top with the stem and push the stem out with your thumbs and discard. Remove the seeds and the white pith with a small knife as this is where any spice will be concentrated, even in sweet peppers. Do not touch your face before washing your hands. To remove the skin, the pepper can be scorched on a grill or over a fire until the skin blackens or baked at 200°C until the skin separates from the flesh, put it in a closed plastic bag to cool and then remove the skin. Eat: Peppers are best grilled or scorched. They can be cooked in olive oil (peperone fritto in padella, friggitelli peperoni con la mollica), marinated, or stewed (peperonata, peperone in umido). Peppers can be stuffed (peperoni ripieni, peperoni imbottiti di maccheroni), roasted (peperone arrostito), baked (peperoni al gratin), pickled (peperoni alla vinaccia, paparolesse, pupazzelle ‘a cumposta), dried, used to dress pasta (pasta con i peperoni), or cooked with meat or chicken (pollo in padella). They are also served raw on their own (bagna caôda, pinzimonio) or in salads. Peppers pair well with olive oil, saffron, fennel, basil, marjoram, garlic, balsamic vinegar, olives, capers, mozzarella, fontina, goat cheese, Parmigiano-Reggiano cheese, tomatoes, aubergine, onion, and courgette. Potatoes are a root vegetable and can be purple, red, yellowish, or white in colour and round or oval in shape. Potatoes are harvested from April until December but are used all year-round. The best potatoes come from Campania but they are also grown in Abruzzo, Puglia, Veneto, and Calabria. The soil the potatoes are grown in will have a big influence on the quality of the flavour and consistency. The most used potato variety is the Bintje which is yellow and firm. The main yellow varieties include: Primura, Sirtema, Sieglinde, Bea, Alpha, Jaerla, Saskia, and Desiree. White floury varieties include: Cardinal, Majestic, Draga, Baraka, Marijke, Tonda di Napoli, and Bianca di Como. The main red skinned variety is Roseval. They can be eaten with or without their skin but skins have lots of vitamins (C, K, B, B1, B6, and folic acid) and minerals (potassium, sodium, calcium, magnesium, and phosphorus). Buy: Buy loose potatoes so that they can each be inspected. Look for potatoes which are evenly shaped and smooth. Potatoes should be firm with no signs of rot, lesions, or brown spots. They should not be soft, green or have roots sprouting from them as these are toxic and are an indication that the flesh is soft and spongy. The type of potato purchased will depend on its use, see below. Potatoes are also dried and ground into a flour (fecola di patata). New potato (Patata novella) is a young potato found early in the season from March until June. It tends to be cooked whole, often boiled or steamed. They are delicate in texture and sweet and have thin skins. Red potato / Waxy potato (Patata a buccia rossa) is low in starch and high in moisture content. They remain firm when cooked so are suited to preparations where the potato will be left whole or cut into pieces and baked, steamed or boiled such as salads. White potato (Patata a pasta bianca) have the most starch and so are perfect for dishes where the potato will be pureed such as in gnocchi, croquettes, moulds and mashed potatoes. Yellow potato (Patata a pasta gialla) maintains its form well so is good for dishes where it will remain whole or in pieces such as roast potatoes, potato salads, sautéed potatoes, and french fries. Store: They should be stored somewhere cool, about 7˚C, dry and dark and can be stored for up to 2 months. New potatoes can be stored for up to one week. Do not store together with onions. If they are stored at less than 7˚ C the starch in the potato converts to sugar and above 8˚C they sprout. Light also makes potatoes sprout. Moisture will cause them to rot. If the potatoes do begin to sprout, rub the sprouts off and discard. If the potatoes have been stored in the refrigerator then store them at room temperature for 2 weeks to reconvert the sugar back into starch. If they have already been cut, then keep them immersed in cold water in the refrigerator for up to 2 days, although they will lose vitamins during this time. Prepare: Rinse under cold water, rubbing to remove any soil. Potatoes can be peeled and will need to be if they will be pureed. 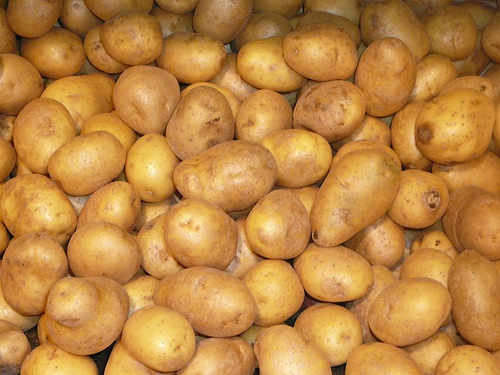 New potatoes need only be scrubbed under cold water to remove their skins. Cut off any green parts or sprouting eyes as they are toxic. When preparing potatoes, once peeled or cut, store in cold water to keep them from browning. If the potatoes will be boiled, start them in cold water so that they cook evenly. Never cool potatoes in cold water as this will destroy their texture. Eat: Potatoes are always eaten cooked. Potatoes are used in soups, put together with pasta (trofie al pesto), made into dumplings (gnocchi), made into croquettes (cazzilli, crocché di patate, subrich), made into pies (baciocca, patate con i funghi tortino, gattò), cooked with seafood (tiella, patate col polpo), in casseroles (patate, cipolle e pomodori in teglia), used in salads, in omelettes (frittata di patate), and to top pizzas and focaccia. Potatoes are grilled, baked, sautéed (patate sauté), deep-fried (patate fritte), fried (frico, patate all’origano), pureed (puré di patate, bagozia, patugol, pitta di patate), roasted (patate arrosto), steamed (patate a vapore), boiled (patate lessate), cooked in ashes, or stewed and served as a side dish or starter. There are many varieties of radishes which range in shape, size and colour. Small red, round radish varieties include: Saxa, Ciliegia, Non plus ultra, Rosso tondo a punta bianca (this variety has a white point) Cylindrial varieties include: Candela di fuoco which is red and Candela di ghiaccio which is white inside. They can have a slightly spicy flavour depending on the variety and type of soil they grew in. They are harvested from March through the autumn. Buy: Look for radishes with fresh, crisp, green leaves with brightly coloured, firm, unblemished roots. It is best to taste one to ensure that it has not become woody and has a good flavour. Store: To store, remove the leaves and store the roots and leaves in separate plastic bags in the refrigerator for up to a week. 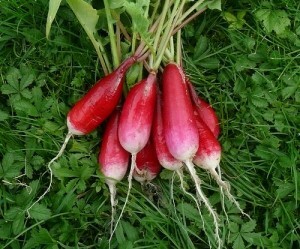 Prepare: Rinse radishes under cold water and cut off the stem end and any root tip. Prepare just before serving otherwise the radish will begin to lose its juice. Eat: Radishes are normally eaten raw with olive oil, salt and pepper as in pinzimonio, whole raw with salt, or in sliced in salads. It pairs well with pecorino. While Italians do not cook them, they can also be braised, stained, or boiled. The leaves can also be cooked like turnip or beet greens. Rocket is a slightly bitter, peppery leaf vegetable which is part of the mustard family. It is sometimes considered a herb and other times a lettuce as it can be eaten as both. 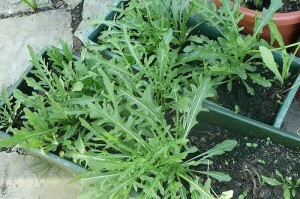 Rocket can be cultivated or grown wild. Rocket has an elongated leaf with a slender stem with smaller leaves coming off the stem. Wild rocket is typically thinner and has smaller leaves with a more delicate flavour. It is a good source of Vitamin C and has some iron. Buy: Rocket is typically sold in bunches or in bags. One bunch is enough to flavour a mixed salad. Look for fresh, crisp leaves which are green (not yellow) and unblemished (not wilted or wet). The larger the leaves, the more peppery and spicy the rocket. Buy small, tender leaves, which are relatively mild in flavour. If sold in a bag, make sure there is no evidence of sweating (precipitation) in the bag. Rocket (Rucola domestica) (Eruca sativa) is cultivated rocket which has a more pronounced peppery flavour and larger broad leaves than wild rocket. It is typically eaten raw. Wild rocket (Rucola selvatica) (Diplotaxis tenuifolia) grows wild in central and southern Italy. It has a more delicate flavour and smaller leaves than cultivated rocket. It is eaten raw but is also cooked. Store: Rocket can be stored in a bag in the refrigerator for 3 to 4 days. Only wash just before eating. Prepare: Loose rocket can be sandy so fill a basin with lots of cold water and agitate the water to allow the sand to fall to the bottom of the basin. Repeat until no more sand is present and dry thoroughly in a salad spinner or on kitchen towels. Discard any long stems. Any pale yellow blossoms can be reserved. Dress rocket with oil and vinegar just before eating or it will go soggy. Eat: Rocket is normally eaten raw, on its own or mixed with other vegetables. It can be used to top pizza, carpaccio, or steak (tagliata) or be cooked in pastas (cavatièddi), casseroles (pancotto con rucola e patate) and soups. It can be eaten steamed. Rocket pairs well with prosciutto, pecorino cheese, Parmigiano-Reggiano cheese, Grana Padano cheese, beef, tomatoes, olives, eggs, onions, figs, olive oil, nuts, lemon and red wine vinegar. Tomatoes are technically considered a fruit but are used like a vegetable. Tomatoes can be round, pear-shaped, tear-shaped, or oval, have smooth skin, meaty flesh, and although they can range in colour from green, purple, yellow, to black, are typically red. The Italian word for tomato “pomodoro” means “golden apple” (pomme d’oro) suggesting the first tomatoes in Italy may have been yellow. They are in season during the summer. As one of the iconic ingredients of the Italian kitchen today, it seems difficult to believe Italians only started cooking with it in the 19th century. The use of the tomato becomes more prevalent the further south one goes in Italy. Tomatoes have vitamins A and C.
Buy: Tomatoes are sold fresh, dried, concentrated, or tinned. Fresh tomatoes should be used in season, if good ones can be obtained. The best tomatoes are grown at home, harvested when ripe and used fresh. This is not possible for many people so in shops, look for fresh tomatoes with a mature, ripe perfume which are unblemished. They should be evenly firm, vividly coloured, and glossy. They should not be hard or have any dark spots, wrinkles, wilting, or soft spots. Misshaped tomatoes are perfectly fine to eat and are often better than uniformly shaped tomatoes. Green-streaked, firm tomatoes are preferred for eating raw while evenly red tomatoes are better for cooking. Preferably the tomatoes won’t have been refrigerated as they become mealy and tasteless inside. 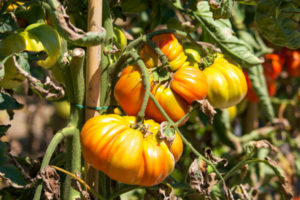 Tomatoes purchased between November to May from the northern hemisphere will have likely been picked green and refrigerated and are not worth buying. If fresh tomatoes are out of season or not of good quality, tinned tomatoes can be used instead (except where the tomato is meant to be used raw or cooked whole). Dried tomatoes are only used when specified and are not interchangeable with fresh tomatoes. 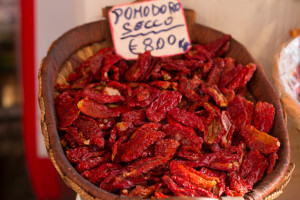 Sun-dried tomatoes (Pomodoro secco) are produced in Liguria and southern Italy. Sun-dried tomatoes are cut in half and left to dry under the sun. They can then be washed in vinegar and preserved in oil and/or flavoured with chilli or herbs. They have an intense flavour and a chewy, leathery texture. 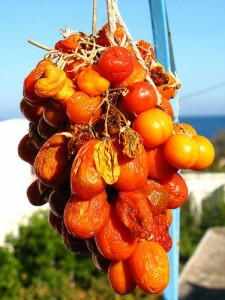 They are eaten as a starter or in sauces in Calabria and Puglia. Cherry tomatoes (Pomodoro da Serbo / Pomodorini / Pomodori da brodo) are small, red or yellow, round, oval, or pear-shaped tomatoes which typically grow in bunches. In South-central Italy, they are left to hang in the fresh air in the winter to partially dry out and concentrate their flavour. Notable varieties include Principe Borghese, di Prato, Piros, and Grappoli d’inverno. These are used in sauces and to flavour broths. Cherry tomatoes / Pear tomatoes (Pomodorino a ciliegia) are small tomatoes sold in bunches, each weighing less than 30 grams. The most famous variety is the Pachino tomato (pomodoro di Pachino PGI) from Sicilia which has two grooves on the sides and pointed bottom. It has thick skin and firm flesh. 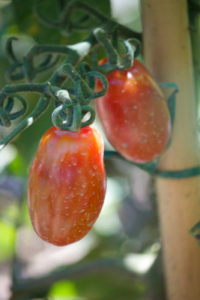 The pendulum tomatoes (pomodorino al piennolo / piennoli) are another variety. These can be eaten raw in salads, made into sauces or dried. Salad tomatoes (Pomodoro da mensa / Insalatari) are good for eating raw. The most common variety is the beefsteak tomato (cuore di bue / bovaiolo) which is heart-shaped. 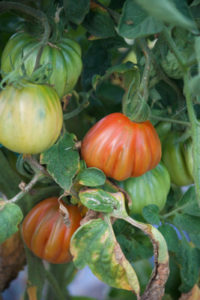 Other varieties include Tondo liscio, Palla di fuoco, Meraviglia del mercato, Marmande, Supermande, Royal Ace, Costoluto Genovese, and Costoluto di Parma. Select tomatoes with some streaks of green and thin skins. The best tomatoes for tinning are the San Marzano plum tomatoes (pomodoro sanmarzano dell’Agro sarnesenocerino / seccagni) – this will be clearly designated on the label. San Marzano tomatoes have lots of flavour, meaty flesh and fewer seeds. Italians use these tinned tomatoes (or passata – tomatoes they have preserved at home by milling tomatoes and then boiling and bottling them) during the winter. 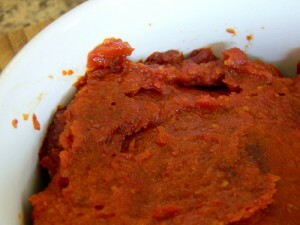 Tomato paste is made by drying Petomech or Tondino tomatoes, pureeing them, drying them again until the liquid evaporates and blending them with oil. It is reddish brown in colour and extremely richly flavoured. It is packaged in tubes, jars and tins. I prefer tubes as I use a small quantity at a time and it is easier to keep this way in the refrigerator. 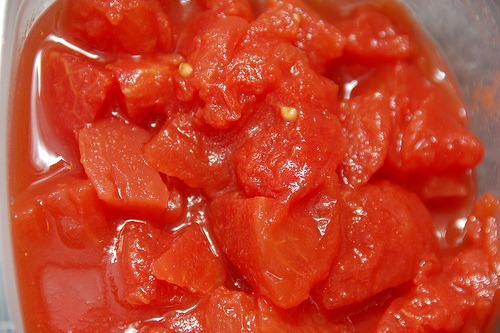 Concentrato di pomodoro is a light variety and the most commonly found. It takes 300 grams of tomatoes to make 100 grams. Doppio concentrato is of medium concentration using 500 grams of tomatoes to make 100 grams. 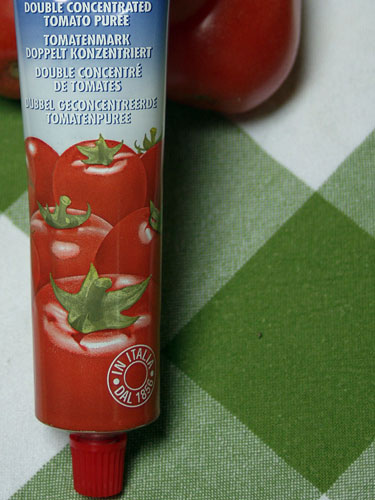 Triplo concentrato is the strongest and uses 600 grams of tomatoes to make 100 grams. Dried tomatoes: Store sundried tomatoes sealed in a cool, dark, dry place. 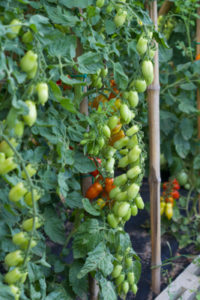 Cherry tomatoes can be left to dry should be hung in a cool, dry place where the air circulates. Fresh tomatoes: Store fresh tomatoes at room temperature, not in the refrigerator as they become mealy. Tomatoes which are bright red are ready to eat. Those with a dull colour can be kept at room temperature for a day or two until they turn bright red. To speed up the ripening process, tomatoes can be placed in a paper bag with a ripe tomato until ready. 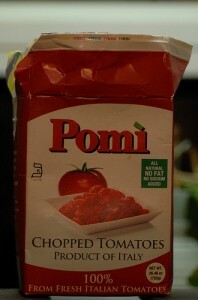 Tinned tomatoes and tomato paste: Tinned tomatoes and tomato paste should be kept in a cool place at room temperature. Once a tin is opened, the contents should not be stored in the tin. These products should be transferred to a plastic or glass container and sealed. The tomato paste can be covered with olive oil to seal it. Prepare: The preparation depends on the type of tomato or tomato product and its intended use. Sundried tomatoes are often soaked in water before cooking. Fresh tomatoes to eat raw: Leave the tomatoes in the sunlight for an hour before preparing. Rinse tomatoes with cold water and cut out the stem. If you are making a dish requiring raw, sliced tomatoes, slice with a small serrated knife, salt and let the slices sit in a colander for an hour in order to lose their excess water. Never let fresh tomatoes sit in dressing as they will become soggy. Cooking fresh tomatoes: To skin tomatoes, score an “X” lightly in the skin and put 2 to 3 at a time in a pot of boiling water until the skin starts to curl, about 30 seconds. Remove with a slotted spoon to a bowl of ice water. When the tomato is cool, use your fingers to easily peel the skin off and discard. To remove the seeds, cut the tomato into quarters, squeeze and use your fingers to dislodge the seeds or cut out with a knife. To see an illustrated step-by-step guide, see here. Once cut open, if the tomatoes appear to be watery or mealy, do not discard them, but rather roast them in the oven with a drizzle of olive oil in order to concentrate their flavour. Tinned tomatoes: Drain the juice the tomatoes are preserved in. To remove the seeds of whole tomatoes, cut in half and squeeze out the seeds. Tomato paste should be used sparingly and is often diluted with hot water or broth before adding to dishes. Eat: Tomatoes can be used in almost every course- in starters, with pasta, in risotto, on pizza, on focaccia, with meat, but traditionally are not used in dessert (although I have had a panna cotta with tomato which was extraordinary). Fresh tomatoes are eaten raw in salads or stuffed (pomodori ripieni a crudo). Fresh tomatoes can be roasted (pomodori arrosto), grilled (pomodori alla griglia) or stuffed (pomodori ripieni al forno, pomodori col riso). 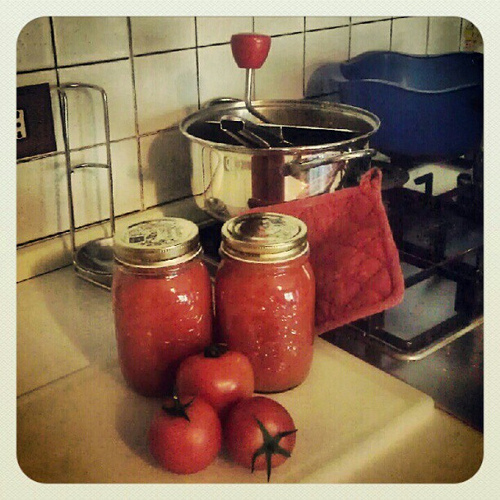 Fresh and tinned tomatoes can be cooked in sauces (salsa di pomodoro, salsa di pomodoro alle verdure, sugo di pomodoro), gratineed (pomodori al gratin), in soup, in tarts (tortino di pomodori) or cooked with meat, fish, eggs, or vegetables. Sun-dried tomatoes can be served as they are with cured meats or conserved with other vegetables. Tomatoes pair well with basil, mozzarella cheese, olive oil, fish, meat, eggs, onion, shallot, celery, thyme, tarragon, lardo, pancetta, butter and most vegetables. Truffles are a wild fungus which grow underground amongst the roots of certain trees. They range in dimension from the size of a walnut to the size of an apple or even larger. Connoisseurs go crazy for their completely unique aroma and flavour. Traditionally pigs were trained to find the truffles, but as they sometimes eat the truffles, they are increasing being replaced with dogs. 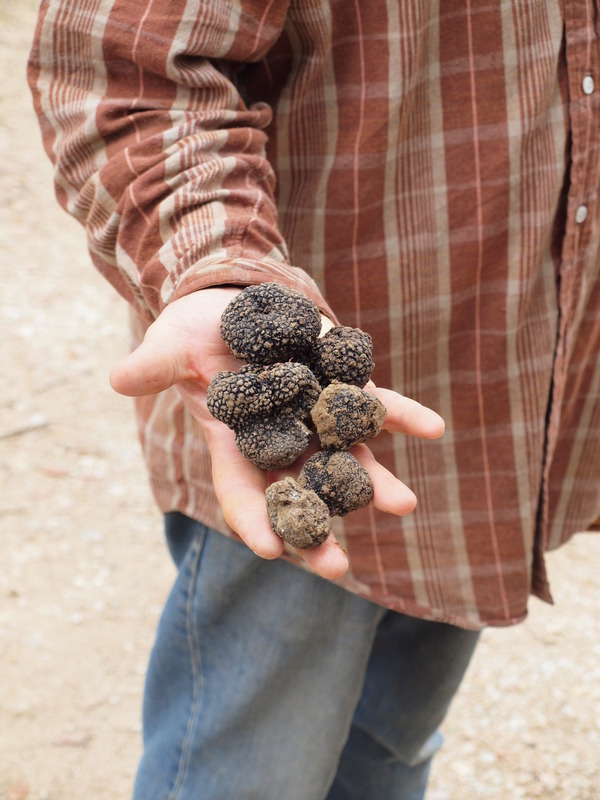 Truffles have not been successfully cultivated so their price ranges from expensive to astronomical. They can be white or black. White truffles (Tuber magnatum pico) are much rarer as they only grow in Italy and Croatia. They can sell for EUR 3,100 per kilo wholesale. They are only eaten raw. The most famous of the festivals to celebrate the white truffle is in Alba, Piemonte, although there also are significant fairs in San Miniato, Toscana and Acqualagna, Marche. Black truffles (Tuber melanosporum) have a milder, slightly earthy flavour compared to white truffles, which is enhanced by cooking. 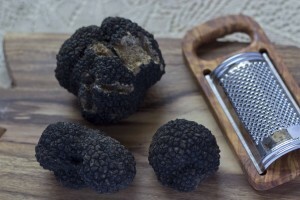 There are also 28 varieties of black truffles but most are inferior to the Tuber melanosporum. Black truffles grow in Europe, North America, Africa, and China. Buy: There are also many truffle-related products in the market: truffle paste, truffle oil, truffle butter and preserved whole truffles. All of these are inferior to the fresh truffle as they often have no flavour, although a drop of truffle oil could add flavour to a dish. Purchase fresh truffles which are firm and free from holes and black spots (pink spots on white truffles are okay). They should have a strong, pungent aroma which reflects their strength of flavour. Some dirt is fine but make sure that you are not paying truffle prices for clumps of soil attached to the truffle. Larger truffles are more desirable as there is less wastage than a smaller truffle, but they are also more expensive. Look for truffles which are more regular in shape, rather than knobbled with crevices. White truffle (Tartufo bianco/Tartufo d’Alba/Trifola/Tartufo piemontesi) (Tuber magnatum pico) is brownish yellow in colour, sometimes with greenish hues. The inside is white or slightly yellow. 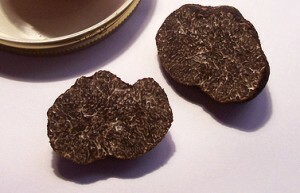 When the truffle is not completely mature, it can sometimes be grey in colour with reddish spots and the inside will have whiter veins. It is found in Piemonte from October to December under oak, lime, poplar, and willow trees. 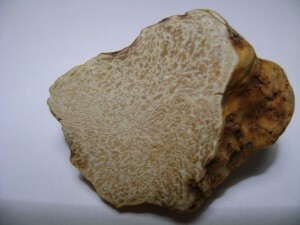 There are immature white truffles which are sometimes on the market in September. They are also found in Toscana, Emilia-Romagna, Veneto, Molise, the Marche, Umbria, and in Croatia. It is typically about 2 to 15 cm in size although some huge white truffles have been discovered in the past. Bianchetti truffles / Spring bianchetto truffle (Bianchetto) (Tuber albidum / Tuber borchii) is a lesser white truffle without the intense perfume of the true white truffle. It ranges in size from the size of a pea to the size of a large plum and grows under pine trees. It has smooth skin which can be yellow, orange, or brown in colour. Black truffle (Tartufo nero / Tartufo di Norcia / Tartufo di Périgord) (Tuber melanosporum) is the true black truffle. It has a bumpy skin which is blackish brown in colour with a purplish hue. The inside is a grey mixed with a purple, brown or reddish black hue. 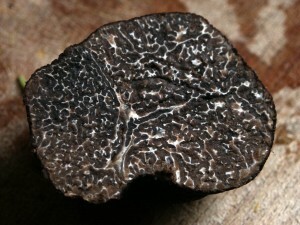 The veins start out white and turn reddish in colour when the truffle is mature. It is found under oak, poplar, and hazelnut trees in Umbria and Toscana, from October to March. It is also found in the Marche, Lombardia, Veneto, Lazio, Emilia-Romagna, Campania, France, and Spain. Autumn black truffle (Tartufo nero ordinario di Bagnoli) (Tuber mesentericum) is an inferior black truffle distinguishable by the small cavity at the base of the truffle. Muscat black truffle / Black winter truffle / Brumale truffle (Tartufo nero invernale) (Tuber brumale) is an inferior black truffle although it also has a pleasant taste. It is irregular in form and has fewer veins which are bright white. 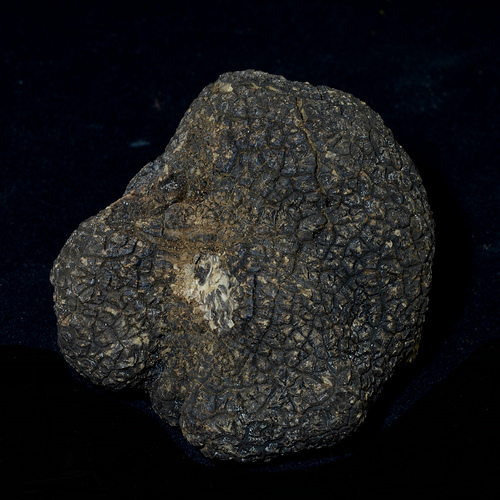 Smooth black truffle (Tartufo nero liscio) (Tuber macrosporum) is brownish red in colour with a bumpy skin and a pleasant, although more muted, flavour. Summer black truffle / Scorzone black truffle (Scorzone) (Tuber aestivum) is an inferior black truffle with a muted flavour and aroma. It is also brownish black in colour but has much larger bumps on the skin and the interior is white in colour. It is found year-round except for in the spring. Store: Truffles should be consumed as quickly as possible as their flavour and aroma deteriorates rapidly after being harvested. If they must be stored, first wrap in a 2 layers of lightly damp paper towel or butcher paper, then wrap in four more layers of paper, place in a sealed container and store in the warmest part of the refrigerator. Change the paper daily. Some people seal truffles together with unshelled eggs or risotto rice in the refrigerator for 3 days so that the truffles can perfume the rice or eggs. 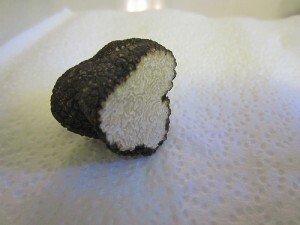 This method does not benefit the truffle however as it dries out. White truffles can be kept for up to 7 days and black truffles for up to 14 days after harvest. If in the unlikely event, excess truffle shavings need to be stored, they can be combined with room temperature butter and refrigerated. Truffle butter can be spread on bread or crackers. Prepare: Truffles should be brushed with a dry, medium-firm brush (can use a toothbrush) and rubbed with a damp cloth to remove any sand or dirt. A box cutter or the tip of a paring knife can be used to cut away any rotten spots or insect infestations. Some people peel the black truffle and pound the peel and use it for stuffings. Black truffle can be pounded, grated, or thinly sliced before cooking. White truffles are thinly sliced with a truffle shaver before serving raw. Eat: White truffles are always eaten raw and should never be cooked. They are served with relatively bland flavours to allow their flavour to shine through and are enhanced by being pared with fattier foods containing butter, eggs, or cheese. 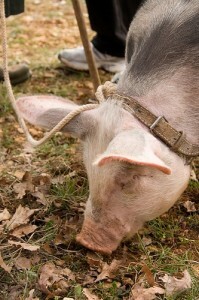 They are used in fondue (fonduta), bagna caôda, risotto (tartufo sul risotto), pasta (tajarin al tarfufo, tartufo su tagliolini), sandwiches, polenta, with raw beef (carpaccio) and with eggs (tartufo sull’uovo al burro). The only dish in which white truffle is cooked is tegamino alla lodigiana (white truffle layered with cheese and baked briefly). Black truffles are eaten cooked with pasta (fettucine col tartufo di Norcia, spaghetti alla Norcia), eggs (frittata di tartufi, uova strapazzatee con tartufo nero), polenta, potatoes, in salami and in cheeses. Scorzone is used in oils and in sauces. Truffles pair well with Parmigiano-Reggiano cheese, potatoes, butter, cream, fish, chicken, veal, pasta, rice and eggs. I love fennel because it is versatile. Fennel are one of the only known foods in the world that have edible seeds, buds, and pollens.